I received a very generous package of O.N.E. 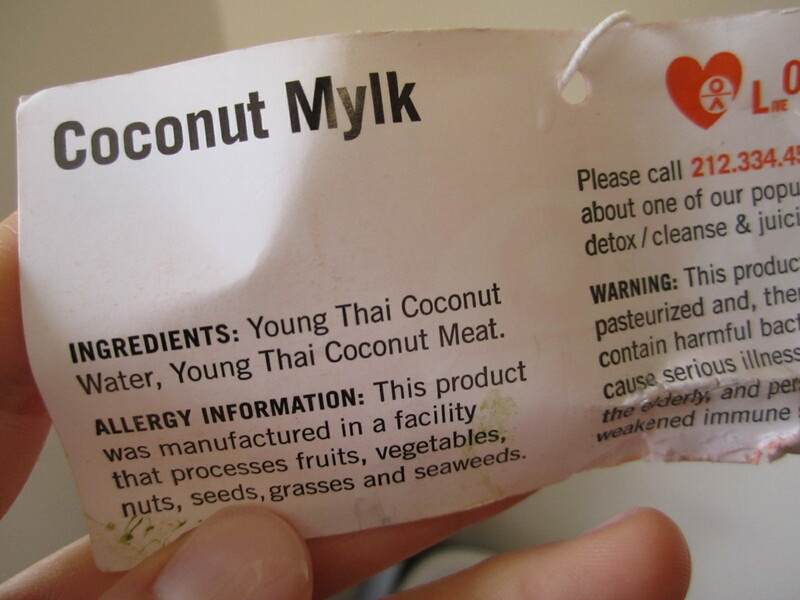 Coconut Water months ago, and I am just getting around to writing a review! As we all know, I love coconut water! I love the taste and its great health benefits. You can read all about the benefits of coconut water here. Now that I am pregnant, I enjoy coconut water even more. It is important to stay hydrated when you are pregnant and sometimes water just doesn’t cut it! I like having a little something else every other day or so, and coconut water is definitely my go to beverage of choice these days. It tastes refreshing and delicious! Plus, it helps to keep me hydrated and gives me some added benefits of calcium, potassium, phosphorous, magnesium and sodium. And, it is all natural with no added preservatives or sugars, so it is good for me and the baby! Lucy, at One Natural Experience, sent me a few different flavors to try, including their new line of sports drinks! O.N.E. 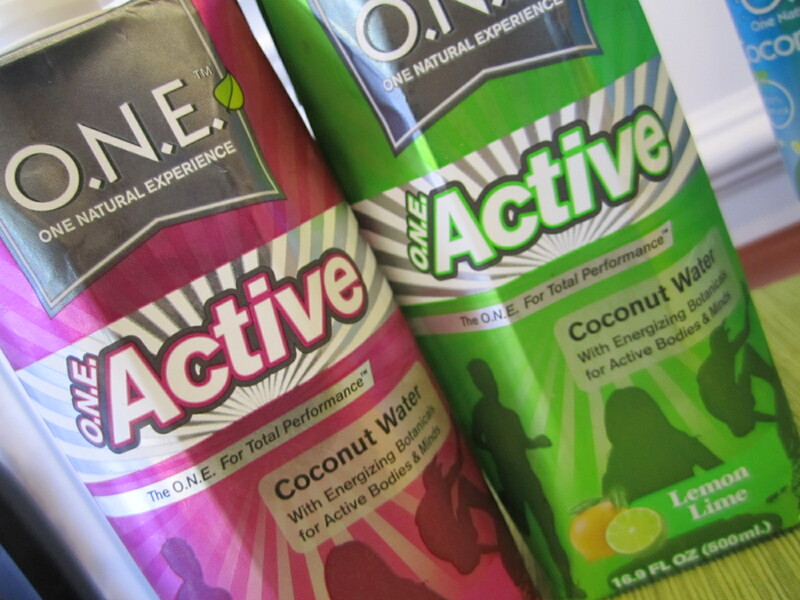 Active starts with the pure water from inside a young green coconut – nature’s original sport drink – then we add ginkgo biloba, panax ginseng, catuaba bark and antioxidants. Because O.N.E. Active contains essential minerals – potassium, calcium, magnesium, phosphorus and sodium – in the form of electrolytes, it is absorbed efficiently into the bloodstream, speeding fluid to your cells to rehydrate, refuel and replenish your body. Quick absorption is essential for warding off fatigue, cooling the body and achieving peak performance. Plain coconut water is already a great choice for a sports drink, so this Active coconut water contains those great benefits with an added bonus. 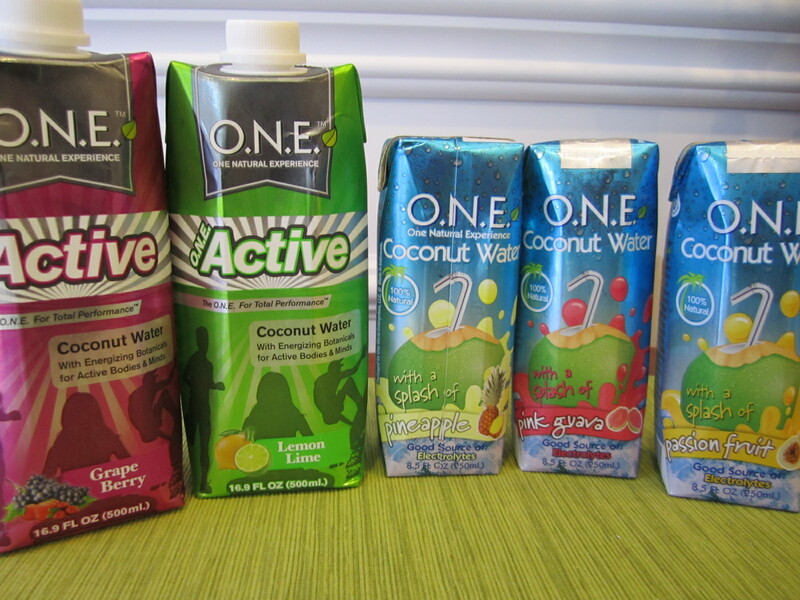 I really enjoyed the active coconut water (lemon-lime was my favorite!). It was a bit sweet, so I like it more mixed with a little plain water, but overall it had a great taste. It does not have that artificial taste that many sports drinks have. And, it contains all good ingredients! I was also sent my absolute favorite coconut water out there – with a splash of pink guava. Just as the name suggests, O.N.E. Coconut Water with a Splash starts with our pure coconut water and we add a splash of fruit juice to offer tropical flavors like Mango, Pineapple and Pink Guava. Containing more than 85 percent coconut water, Splash offers tasty selections that still provide all the health benefits of drinking plain coconut water. This line of coconut water is awesome because it tastes like regular coconut water with (like it says) just a splash of fruit juice. It is not too sweet and is still thirst quenching. 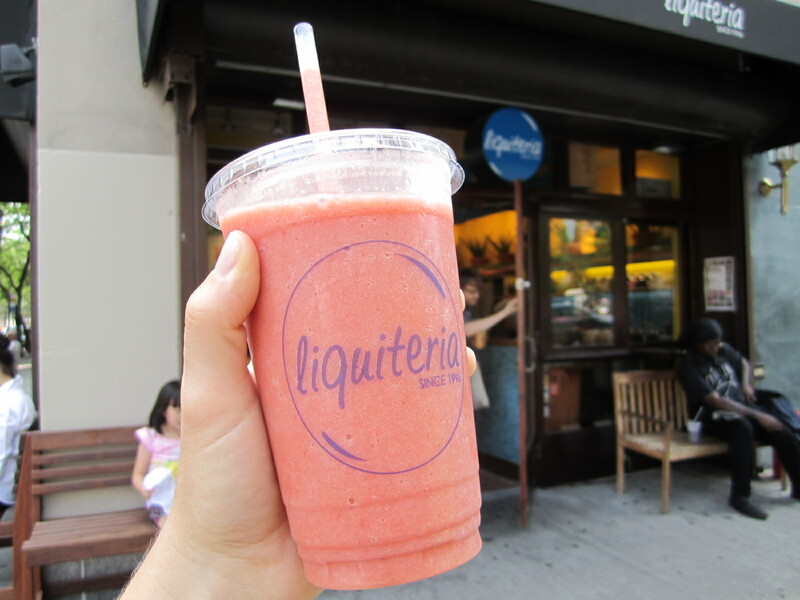 All of the flavors are good, but the pink guava is by far the best in my book! O.N.E. 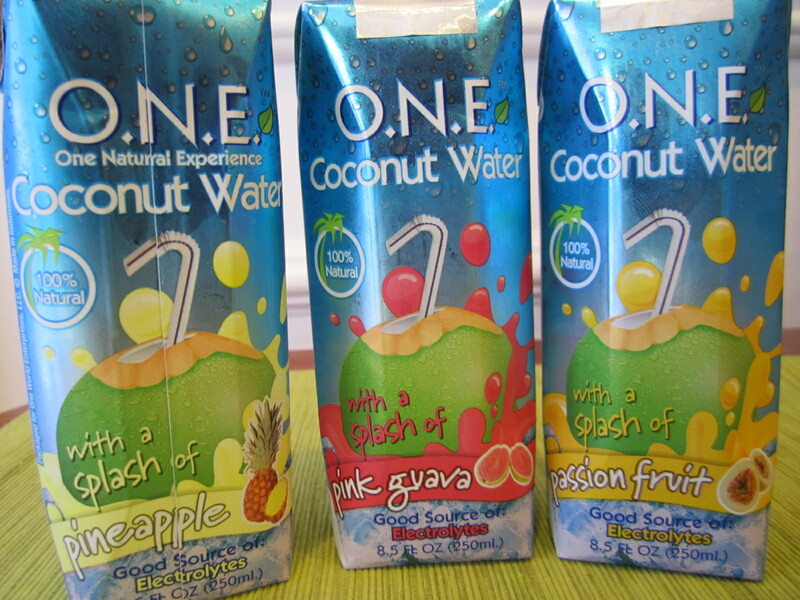 also has a kids line of coconut water drinks! O.N.E. Kids is a great tasting, super hydrating and nutritious beverage with less sugar than typical fruit juices, and the five essential electrolytes naturally present in coconut water. It’s O.N.E. huge step for kids and parents who care about their health. 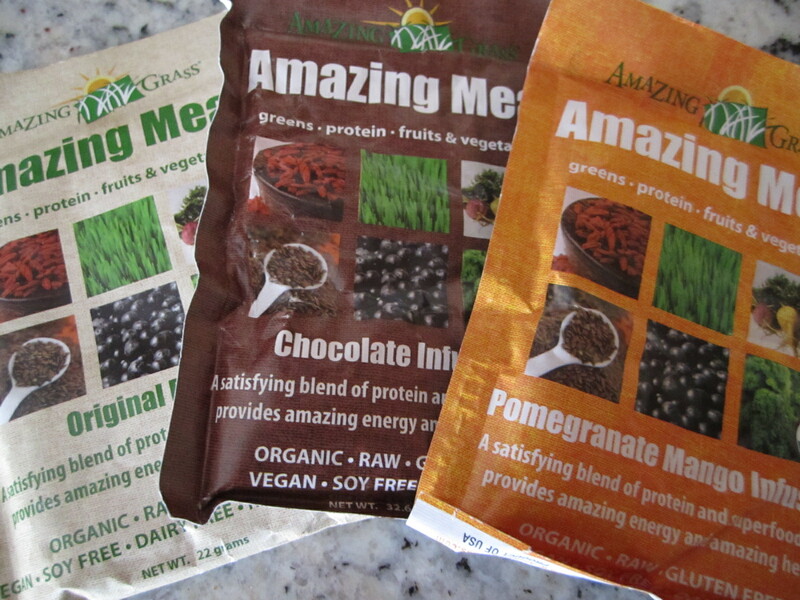 A few months ago, the wonderful folks at Amazing Grass sent me some samples of their protein powder and bars to try out. I already knew that I love Amazing Grass products, but I was really excited to try out the new Vanilla Chai flavor! 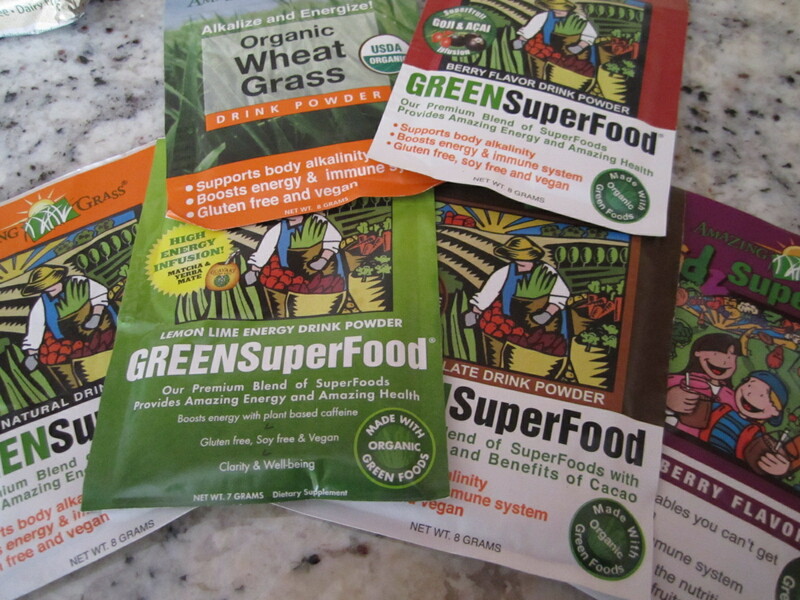 If you are not familiar with Amazing Grass products, they have a variety of protein powders, superfood powders and energy bars. Each of their products contain plant based mixes of whole fruits and vegetables that allow you to easily get some green nutrition every day. 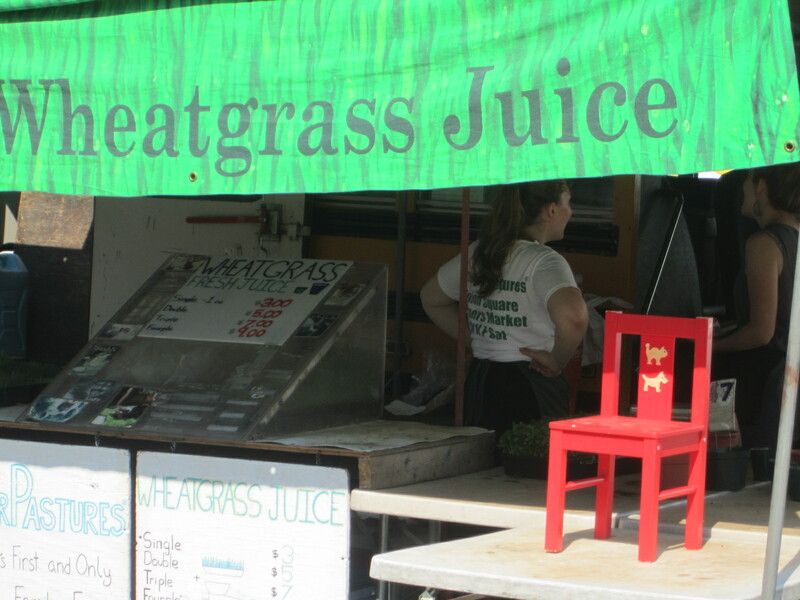 Personally, I prefer to get my nutrients from the actual foods – eating whole veggies, fruits, etc – but, I love these Amazing Grass products when I am on the go or running out the door and don’t have a chance to eat as many fruits and veggies that day. I always pack a few packets with me to take on vacation, like I did when we went to Florida last week. 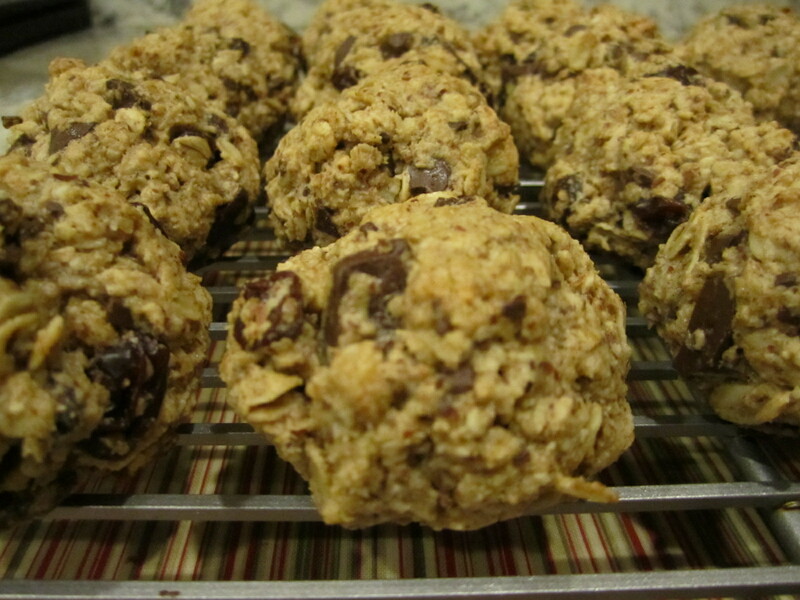 Mixed with milk or water, they make a great post-workout snack or a regular snack while on the go. Amazing Grass Green SuperFood is a perfect blend of alkalizing greens, antioxidant rich whole food fruits and vegetables, immune boosting support herbs, and friendly pre & probiotics. Our powder mixes so easily with water; you’ll wonder how essential green nutrition could taste this good. 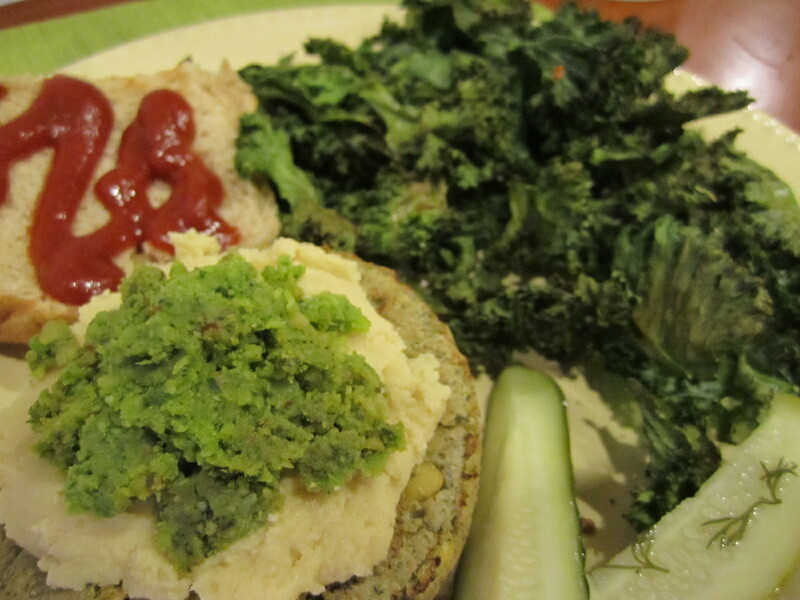 The green superfood definitely tastes, well, green! To me, I don’t love the taste alone, but mixed with a smoothie, I can hardly taste it! Luckily, there are a variety of flavors to choose from – chocolate and berry are my favorite. 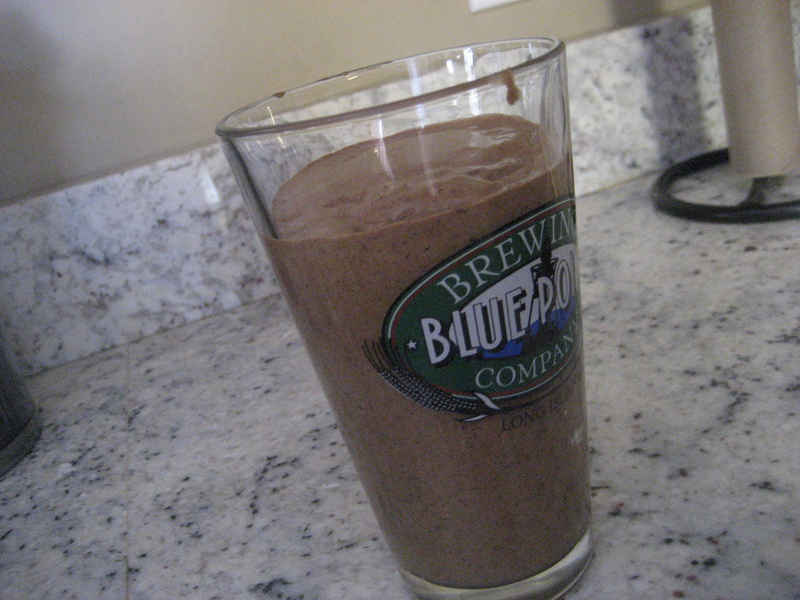 The chocolate mixed with 8oz of milk tastes like chocolate milk (with a green kick!). 🙂 It also makes you feel great and gives you a boost of energy if needed. 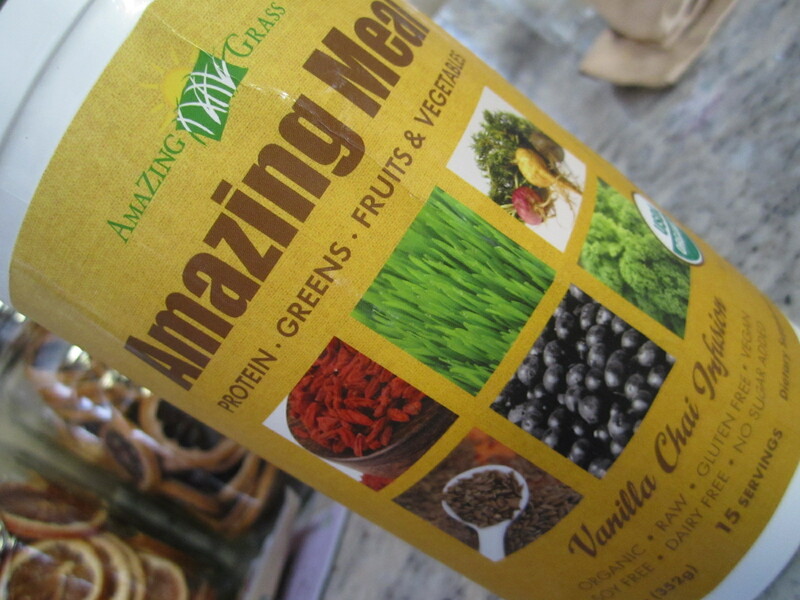 Amazing Meal is a powerful and satisfying blend of Green SuperFoods, plant based protein, phytonutrient rich fruits & vegetables, digestive enzymes and probiotics. 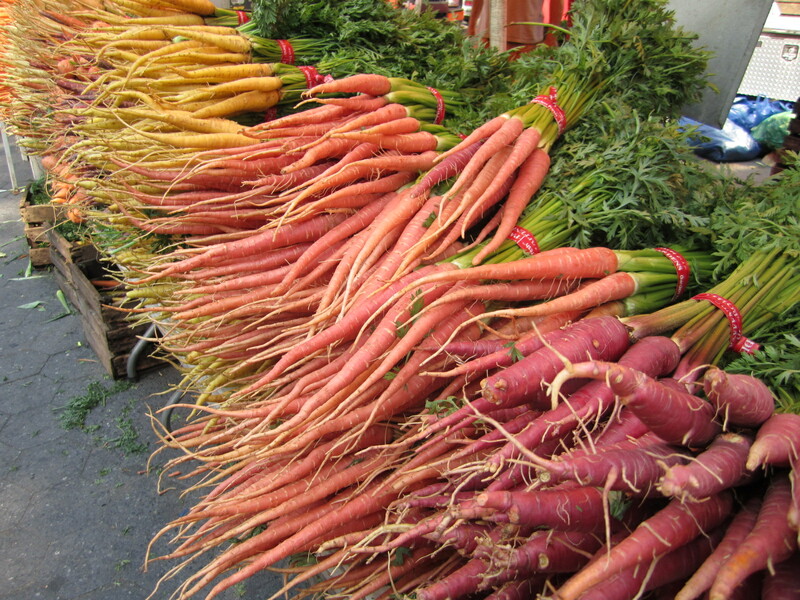 The way Mother Nature intended…Organic, Raw and Delicious. The ‘meal’ powders are my absolute favorite, especially the chocolate! 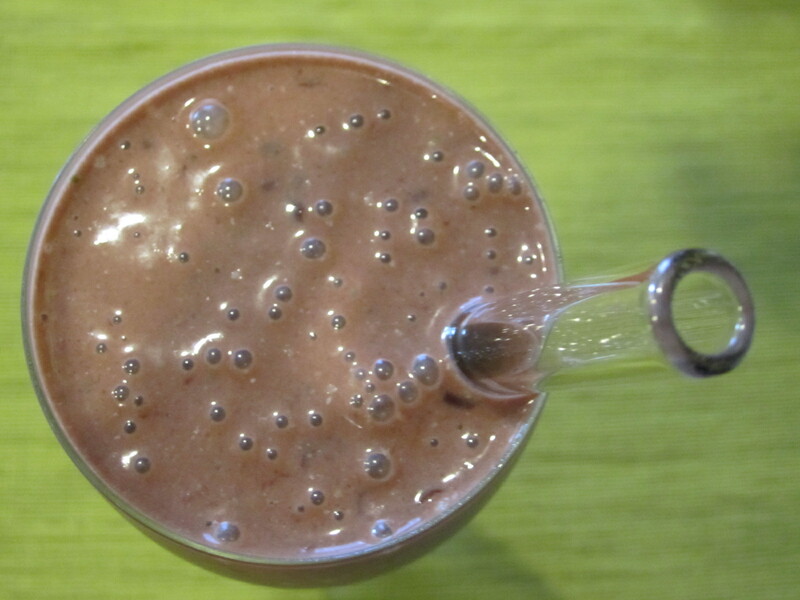 Mixed with milk and a banana (and blended), it makes an amazing meal on the go. Chocolatey and delicious, and barely any grassy flavor. 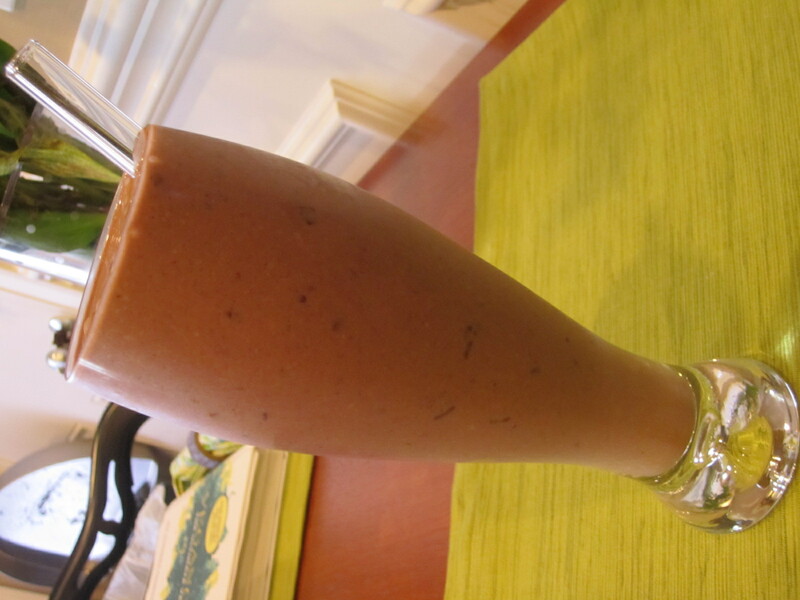 I made one of these smoothies everyday in Florida and it was great. 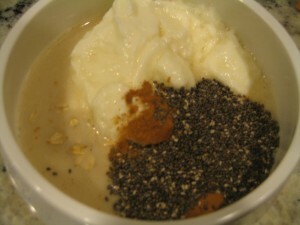 It gave me plenty of protein, fruit, greens and dairy to start my day refreshed and energized. The new Vanilla Chai flavor is delicious! 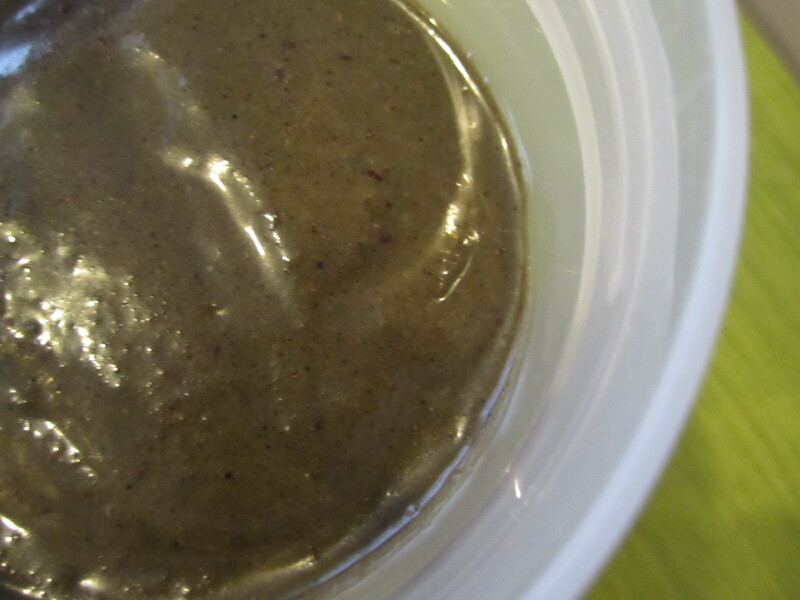 It does contain stevia, which I don’t love due to the taste, but when mixed into a smoothie, I can barely taste it. I have been mixing this flavor into any type of smoothie, but I particularly love it mixed with cherries! 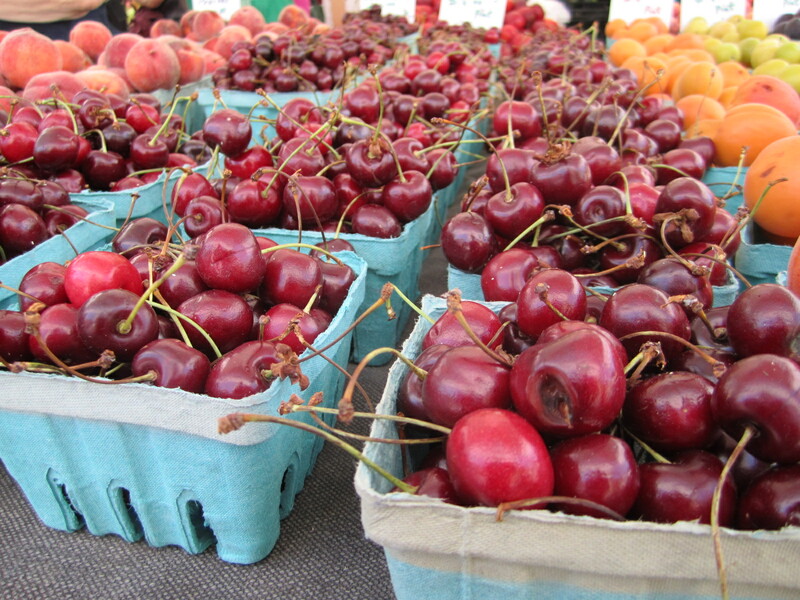 Cherry Vanilla Chai – yum! 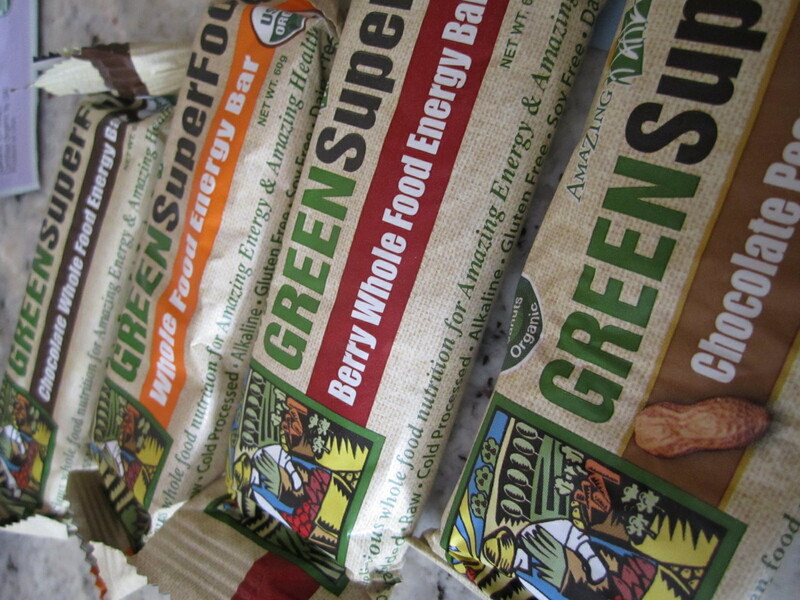 Our certified Organic Green SuperFood Energy Bars feature a premium blend of nature’s most nourishing and delicious SuperFoods. The energy bars provide health conscious consumers with a more potent, convenient and affordable way to satisfy their hunger and deliver nutrients to their bodies the way Mother Nature intended – unprocessed, organic and delicious. I was definitely a little skeptical about these bars! 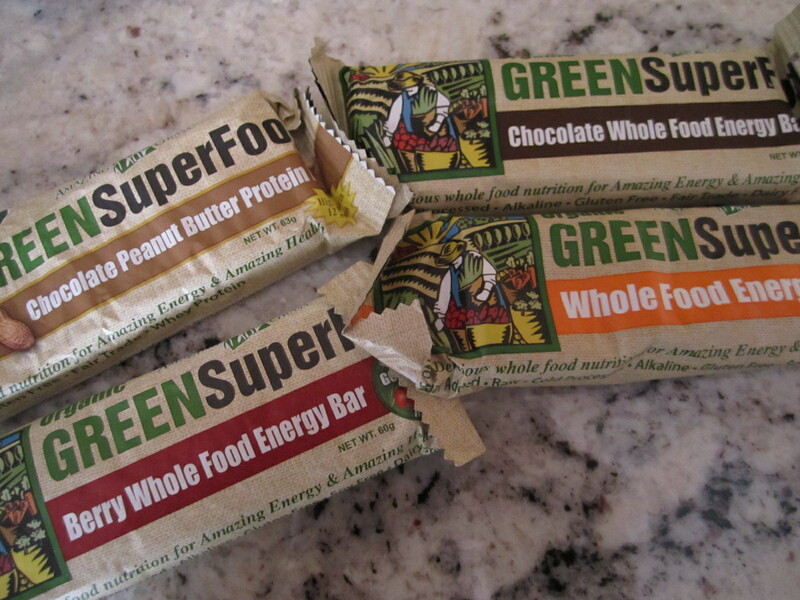 I mean, I didn’t want to eat a bar that tasted like greens…that didn’t seem like fun! But, I was pleasantly surprised. 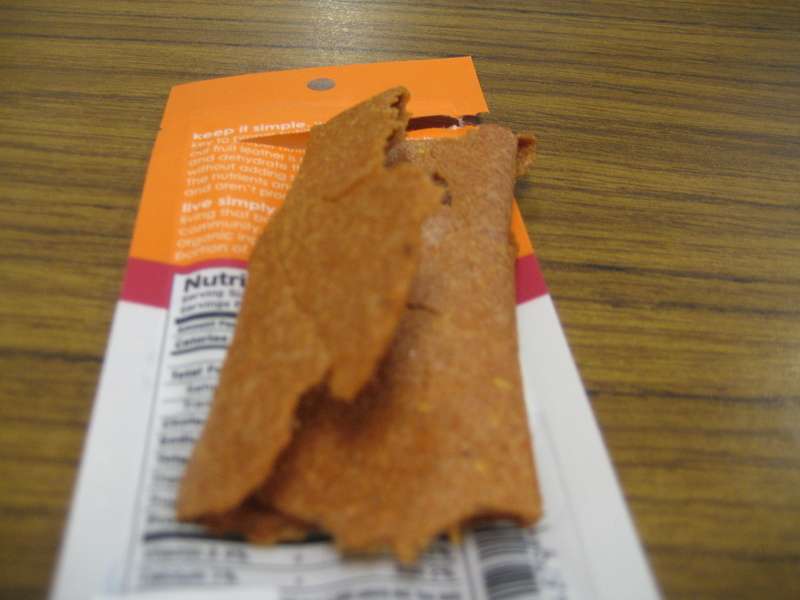 They have a good, normal bar texture and have a little crunch to them. 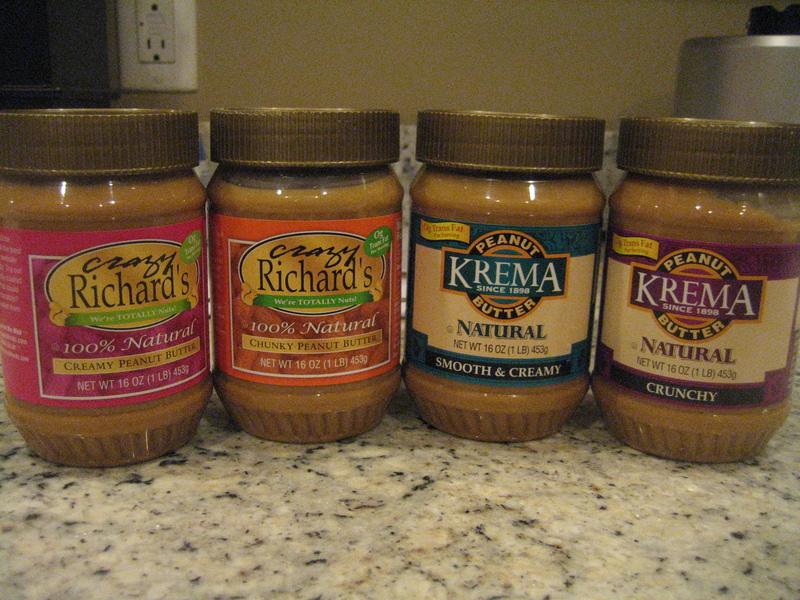 My favorite is by far the Chocolate Peanut Butter. 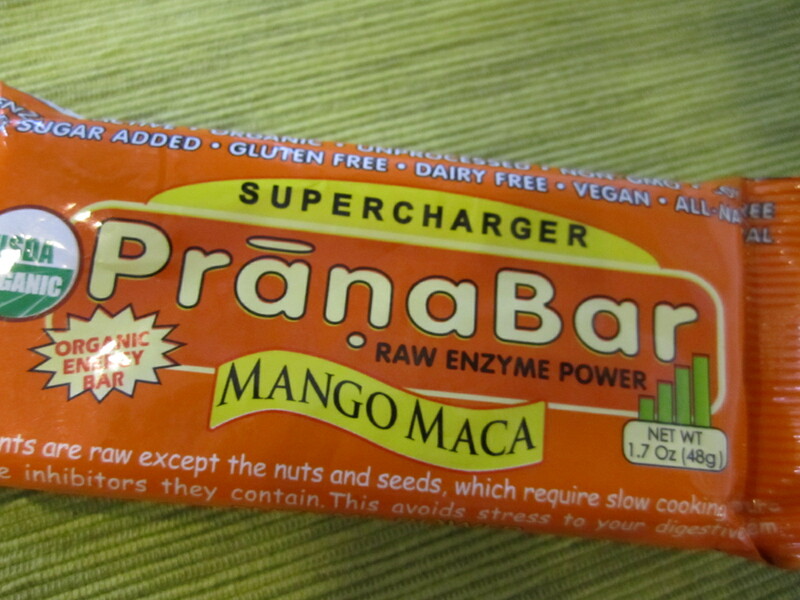 And, I love that they contain all natural and organic real foods mixed up into the bar. Some bars on the market these days are basically candy bars! 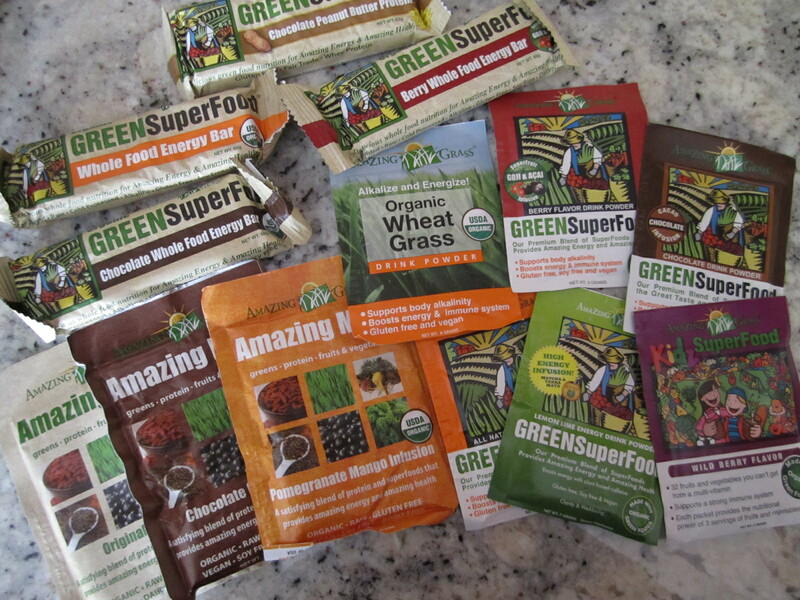 Thanks, Amazing Grass for sending me these awesome products! I know that I have talked about Chia Seeds in the past, but they came up in a book that I was reading, so I decided that I wanted to mention them again! 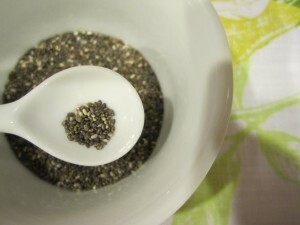 “Months later, I’d learn that iskiate is otherwise known as chia fresca – “chilly chia.” It’s brewed up by dissolving chia seeds in water with a little sugar and a squirt of lime. In terms of nutritional content, a tablespoon of chia is like a smoothie made from salmon, spinach, and human growth hormone. As tiny as those seeds are, they’re super packed with omega-3s, omega-6s, protein, calcium, iron, zinc, fiber, and antioxidants. If you had to pick just one desert-island food, you couldn’t do much better than chia, at least if you were interested in building muscle, lowering cholesterol, and reducing your risk of heart disease; after a few months on the chia diet, you could probably swim home. Chia was once so treasured, the Aztecs used to deliver it to their king in homage. Aztec runners used to chomp chia seeds as they went into battle, and the Hopis fueled themselves on chia during their epic runs from Arizona to the Pacific Ocean. The Mexican state of Chiapas is actually names after the seed; it used to rank right up there with corn and beans as cash crop. Despite its liquid-gold status, chia is ridiculously easy to grow; if you own a Chia Pet, in fact, you’re only a few stepped away from your own batch of the devil drink.” From Born To Run by Christopher McDougall. Now do you believe how great chia seeds are for you?! 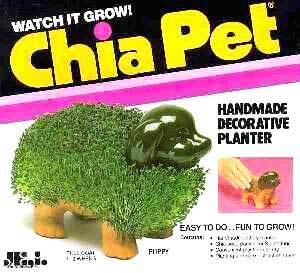 …the chia pet is sprouts grown from the seeds. Obviously, if kept dry, yours will not sprout. 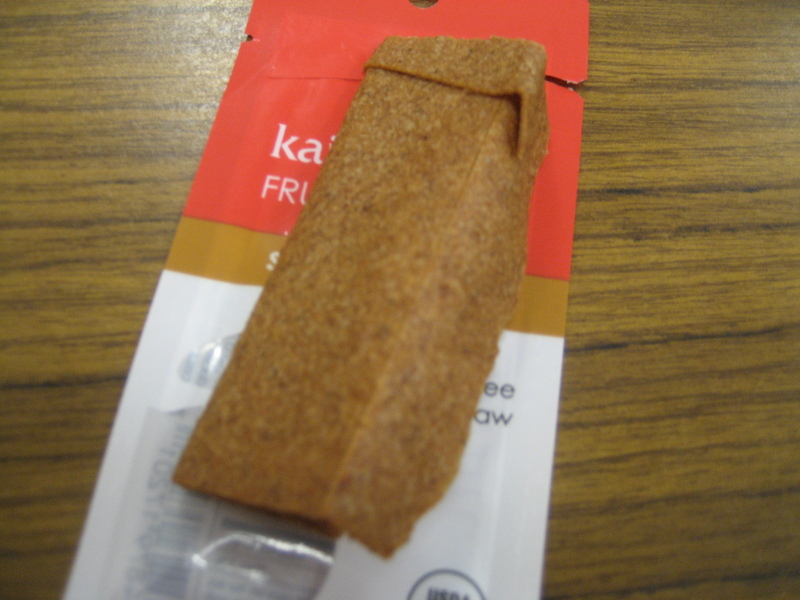 They are also great as salad toppers, oatmeal toppers and cereal toppers. And, I have heard that they can replace flaxseeds in some recipes. I hope to try that out soon! 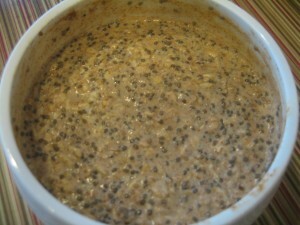 Chia seeds have become very widely available over the past few years. I have always seen them at Whole Foods and my local health food store. Give them a try! 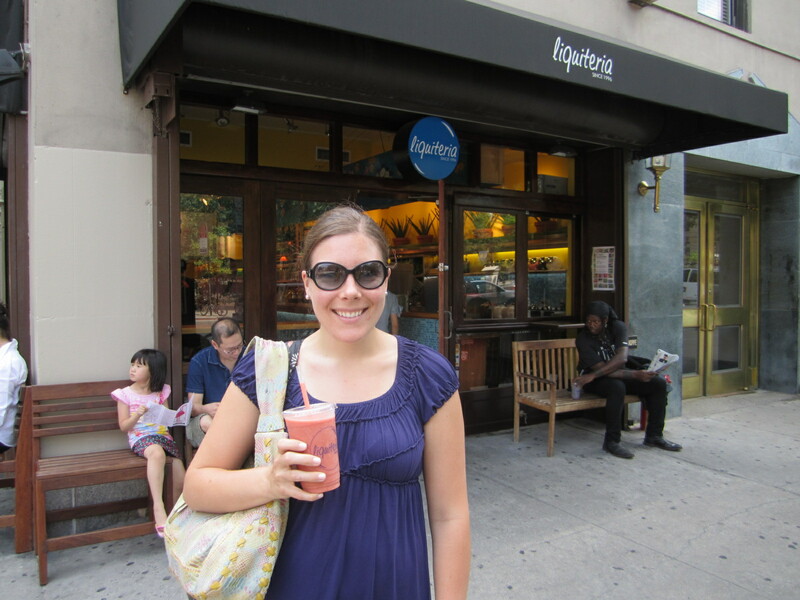 I love visiting New York City with all of it’s juice bar’s and vegetarian restaurants! It is so different from Boston, which has nothing!! We didn’t have much on the agenda yesterday, so I took Brant on another ‘walking tour’ of my favorite places to pick up some souvenirs to take home. It was HOT!! But, still very enjoyable. 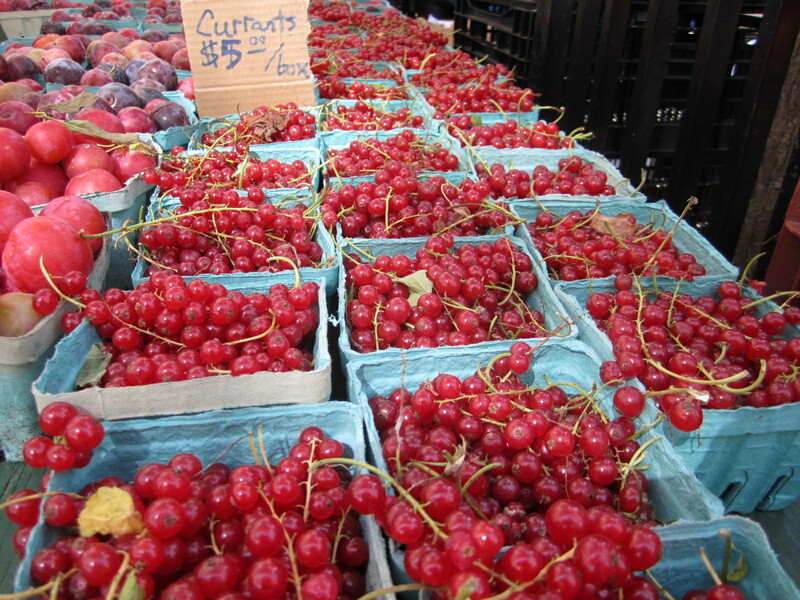 First stop, the Union Square Farmer’s Market! The fresh produce was calling my name, but I held off for our CSA. I took some photos, though. 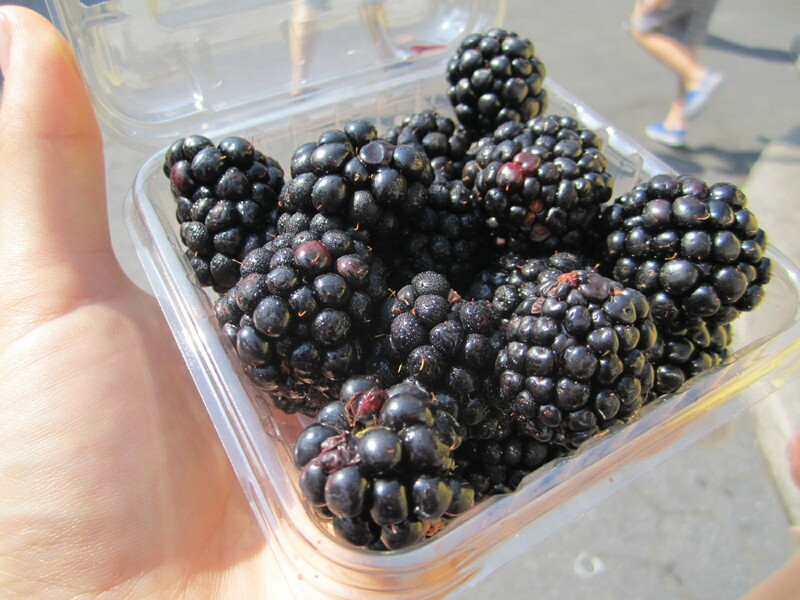 We did grab a container of blackberries to eat on our walk with our bagels and they were delicious! 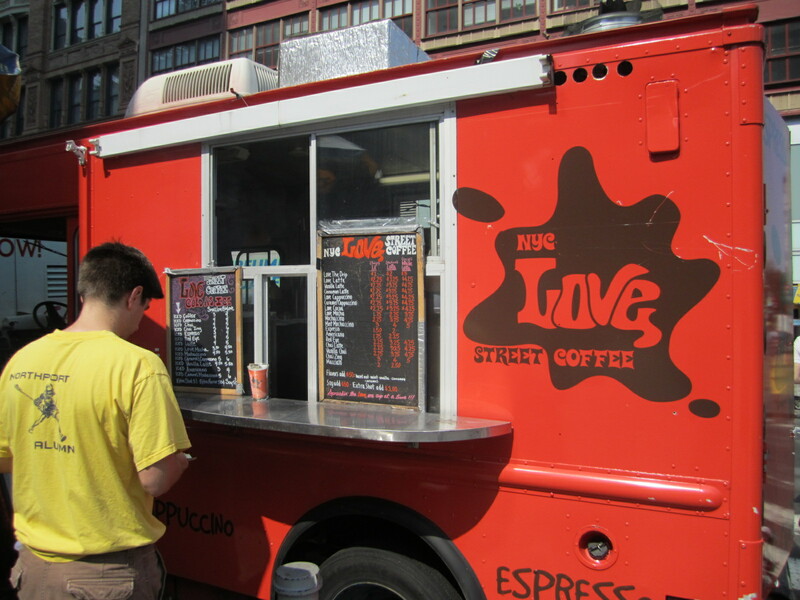 How cute is this coffee shop on wheels?! 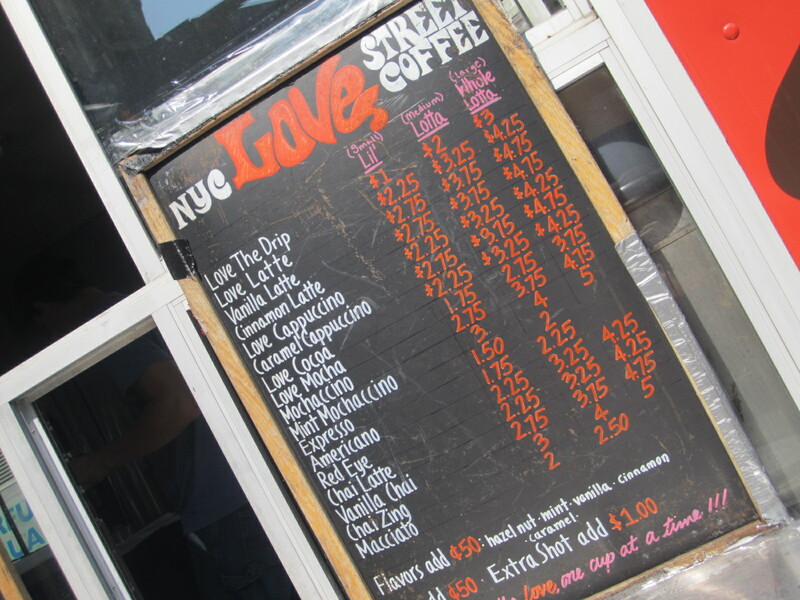 NYC Love Street Coffee. Brant picked up some iced coffee. 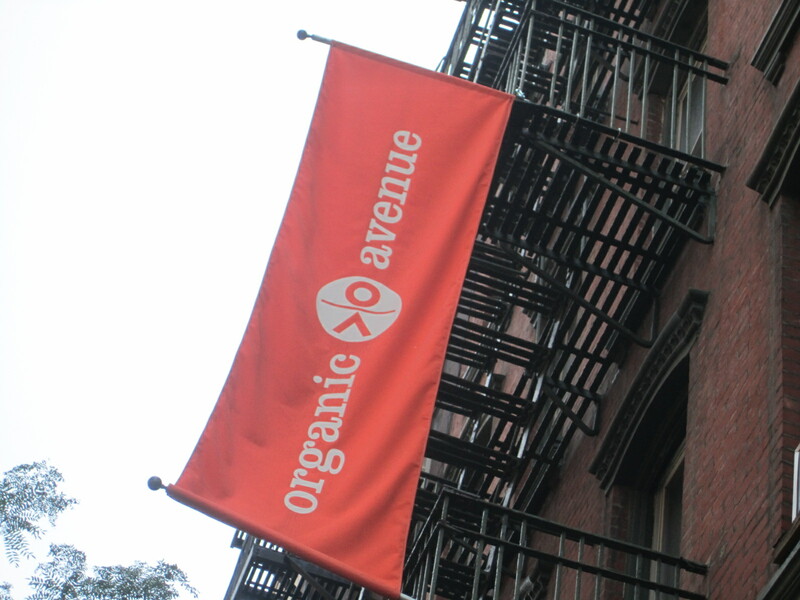 At this point we were dying of heat, so we hailed a taxi to take us to our next stop – Organic Avenue. I have been wanting to visit the store, but hadn’t had a chance on my last few trips to the city. I am glad we had time today! 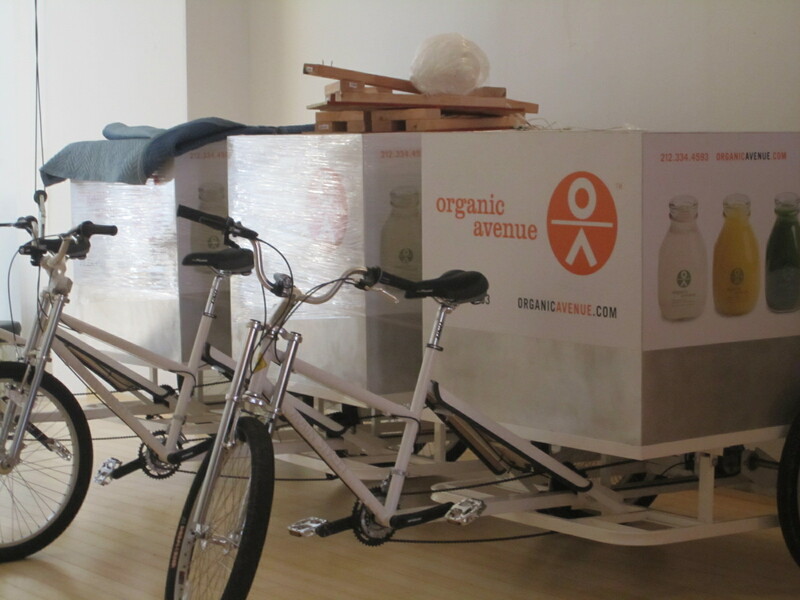 Organic Avenue sells juices, smoothies, raw foods, supplements, etc. 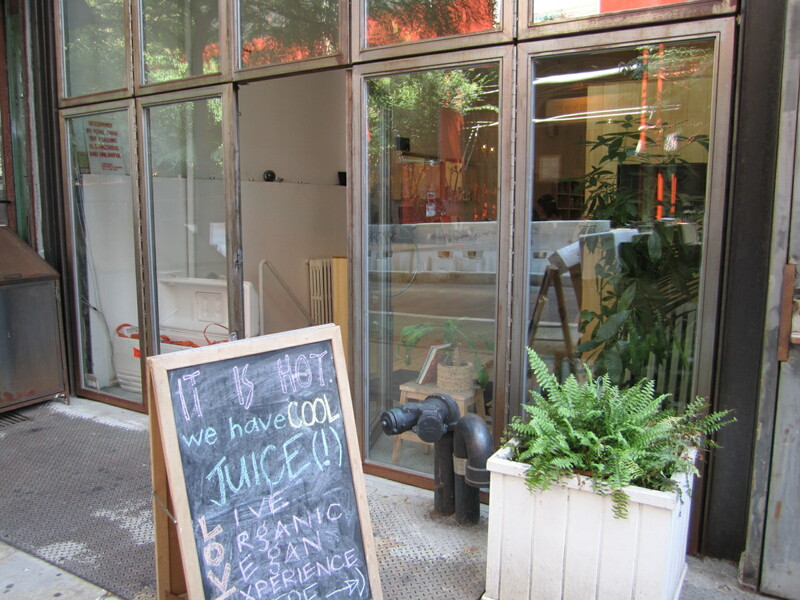 They also offer juice and raw food cleanses, and even deliver it to your door! 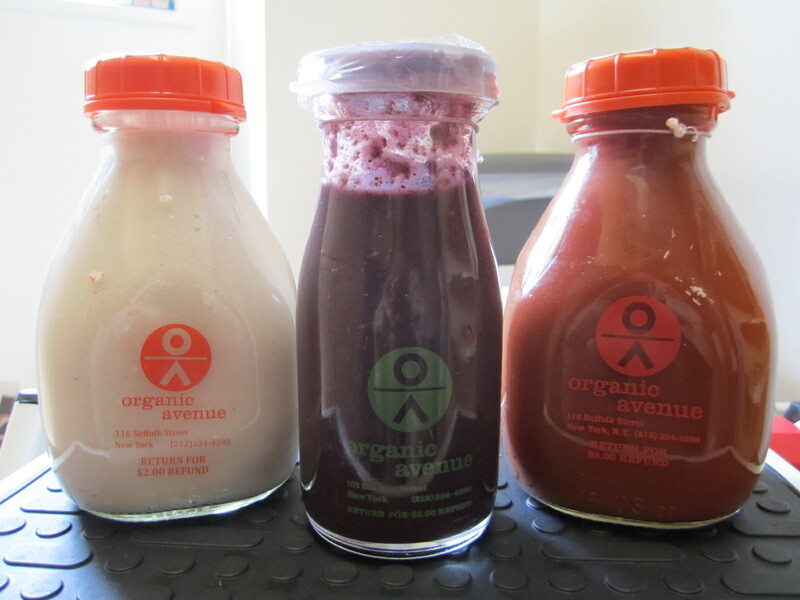 Their juices come in these great glass bottles (which you can return for a refund), but I wanted to take a few home with me, so I picked out some juices to buy – Coconut Mylk, Blueberry Spirulina Smoothie and Veggie Love. I will let you know how they are once I try them! We were ready for lunch after this stop, so we walked back to Union Square, stopping at Liquiteria for a Peaches-N-Dream Smoothie on the way. 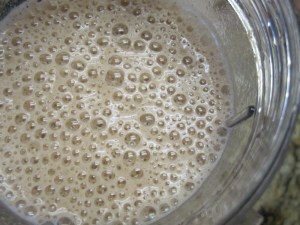 The smoothie was made up of peaches, strawberries, bananas, apple cider, cinnamon, aloe vera and energy memory. It tasted great. 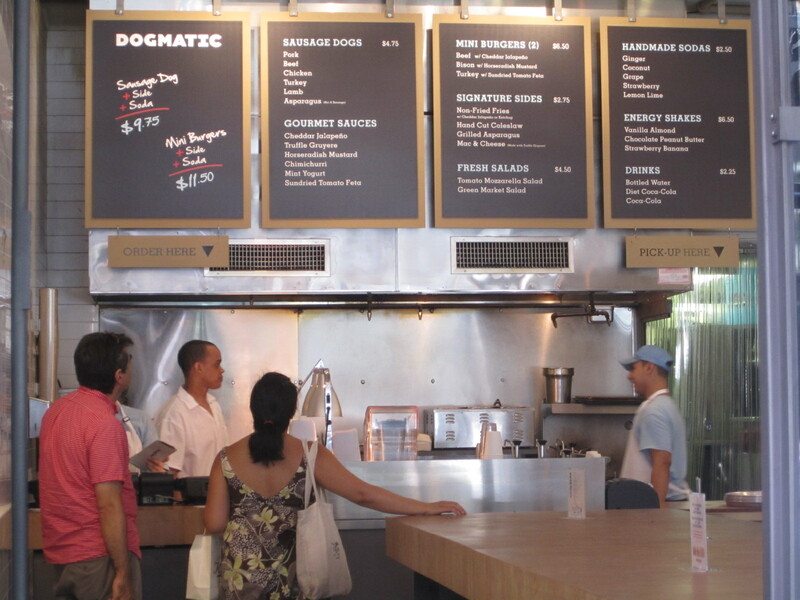 We went to Dogmatic for lunch. 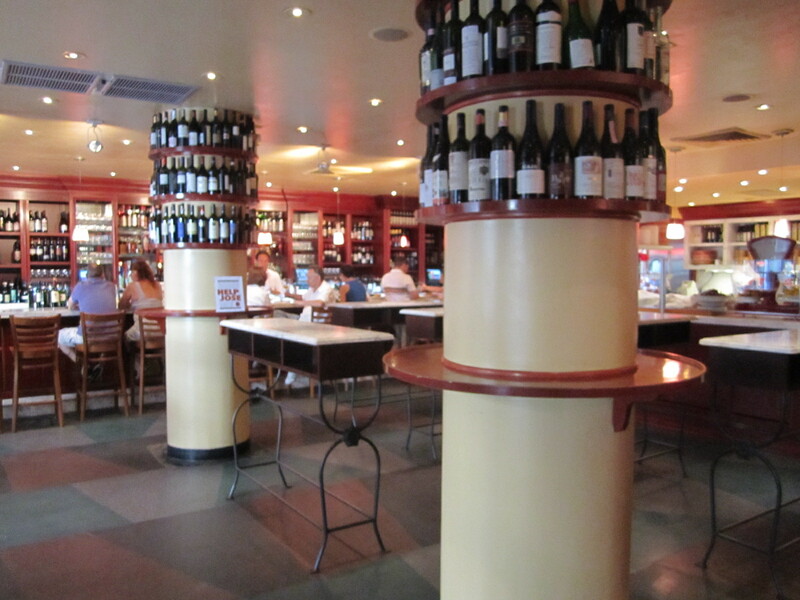 It is a fun ‘fancy sausage’ take-out place. They cook their rolls on a fancy machine that leaves a hole in the middle. They pour in a sauce of your choice and fill it with a sausage of your choice. 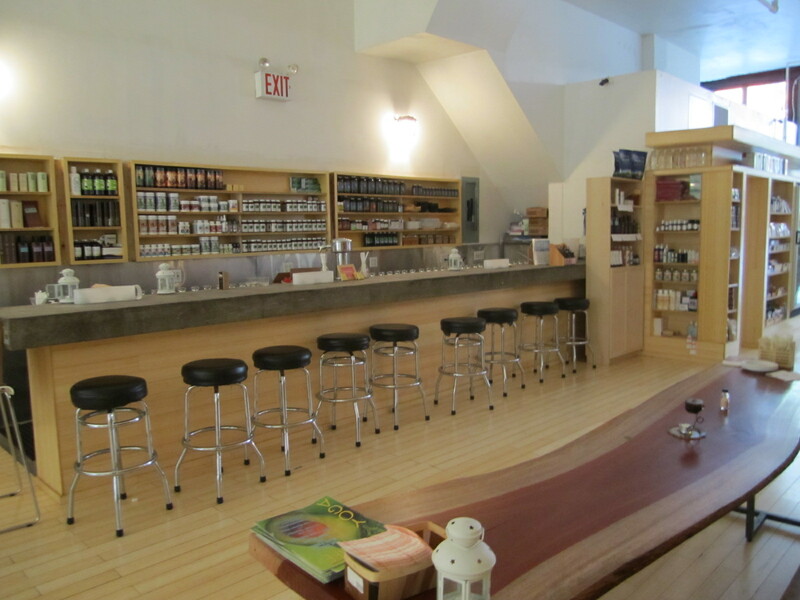 All of their food is free from hormones, antibiotics, preservatives and artificial flavors. 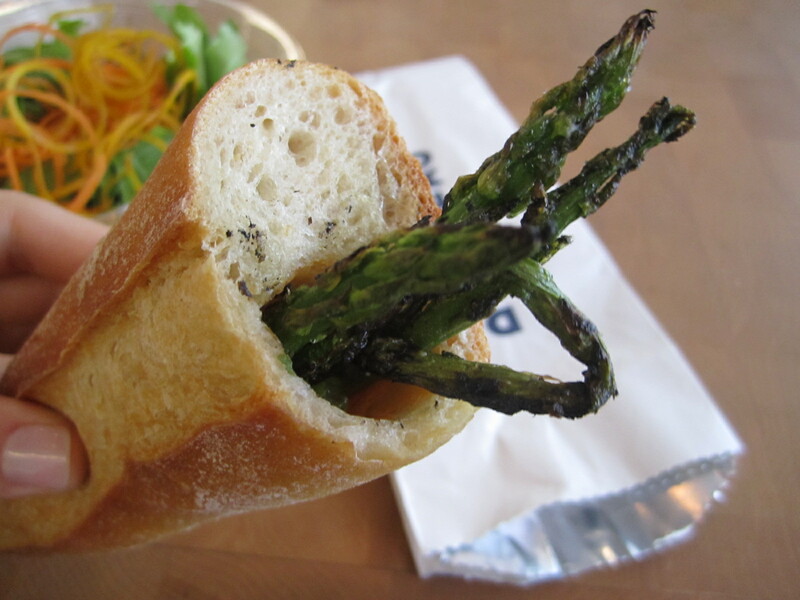 I chose the asparagus with sun-dried tomato & feta sauce with a side salad. Isn’t this a neat concept? And, it tasted great too. 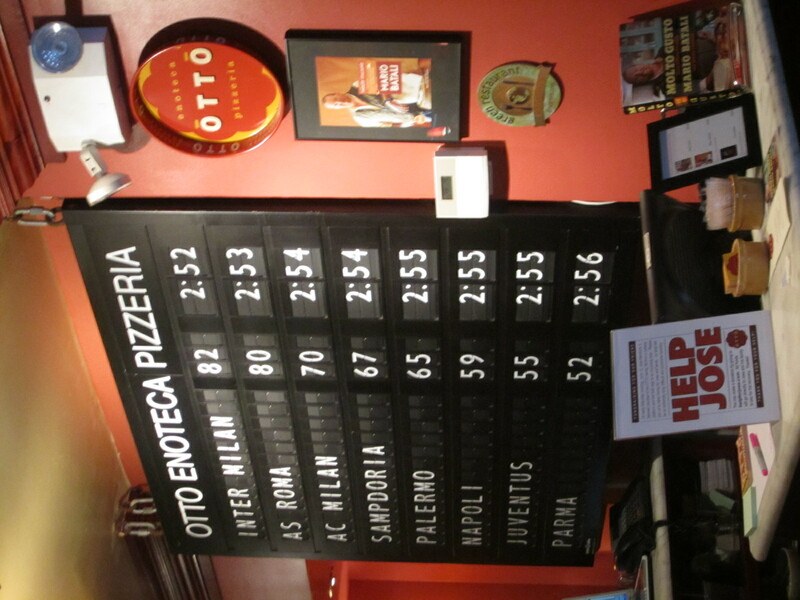 After a quick stop at One Lucky Duck for a raw Moonpie and Mallomar to take home, we were on our way to dinner at Otto Pizzeria. 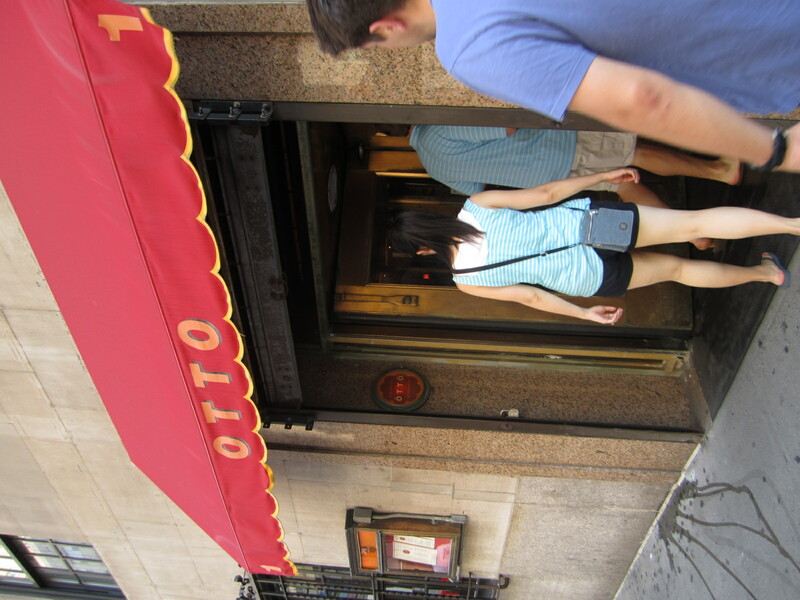 Otto’s was opened by Mario Batali and is apparently modeled to look like an Italian train station. And, they are a Certified Green Restaurant! 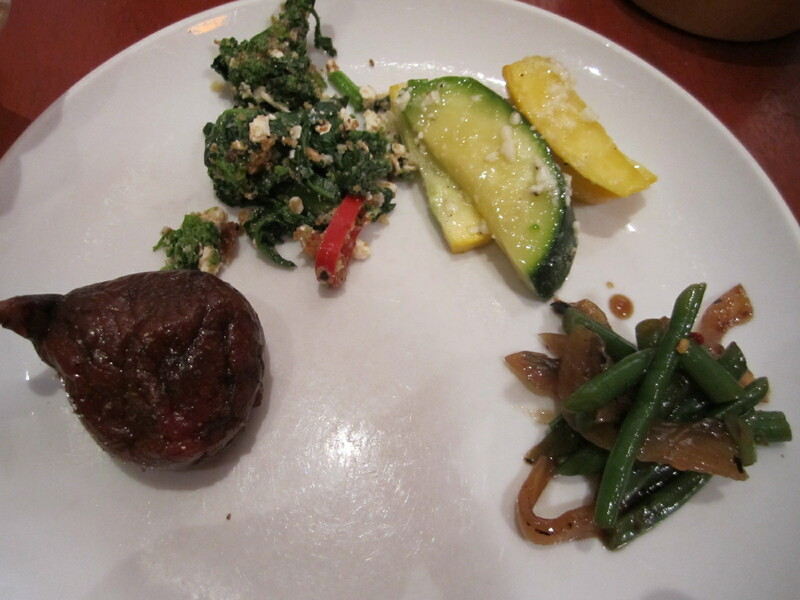 We started with some Antipasti – Poached Figs, Broccoli Rabe, Summer Squash, Green Beans. They were all great, but I especially liked the green beans and the fig! 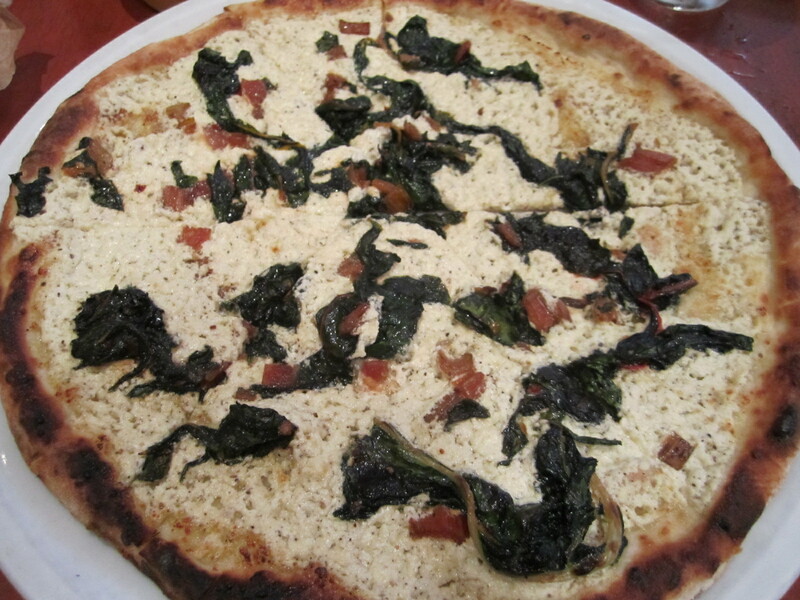 For my entree, I ordered the Swiss Chard & Goat Cheese Pizza – so garlicky, but so good! 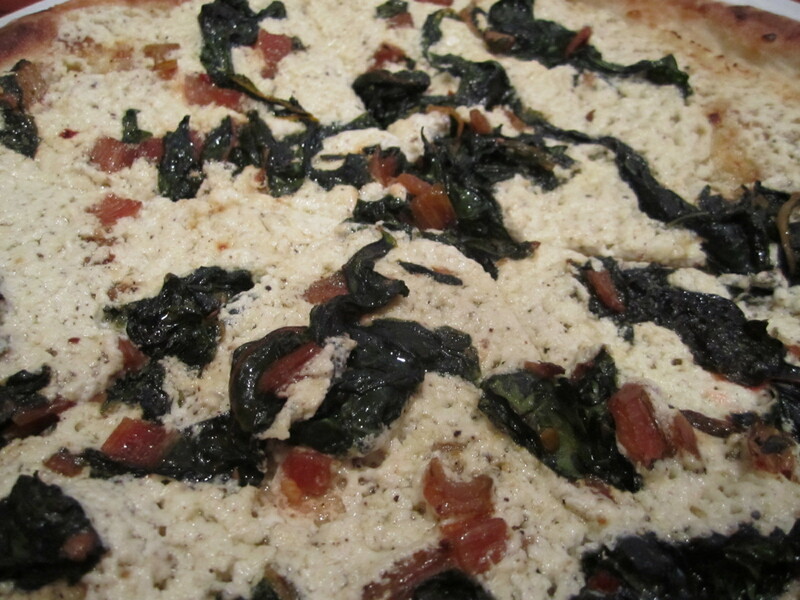 The pizza was spread thinly with goat cheese and then topped with swiss chard stems and leaves. 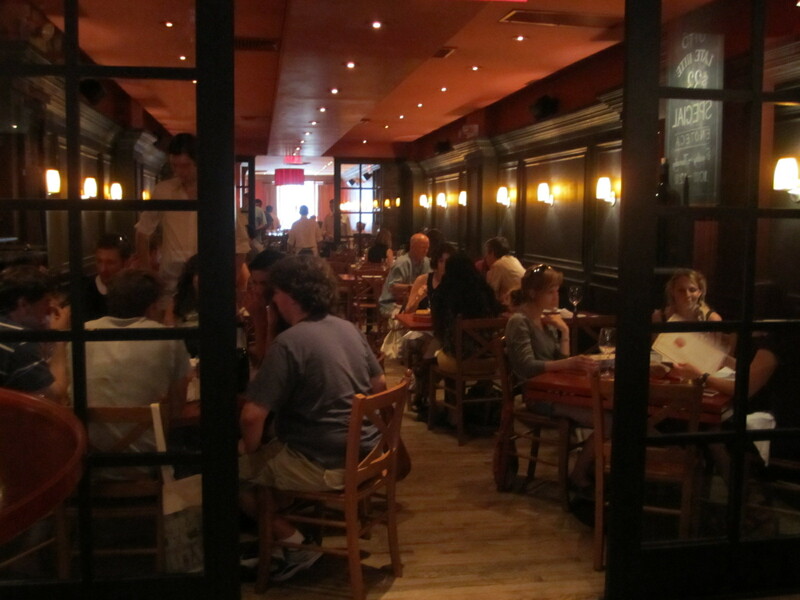 It was a delicious meal and I left feeling stuffed and ready to make our way to Citifield for the Dave Matthews Concert! Brant and I headed out for a run first thing this morning. We had a great 3 mile run, then I went on to complete another 2 miles totaling 5 miles for the day. It was a great run and I love having a running buddy, but boy was it humid! You could have cut the air with a knife…I don’t think that I have ever sweat so much! Ha! After my run, all I was craving was a smoothie. I mixed up my favorite Chocolate Cherry Bomb. This was perfect after a hot and sweaty run. I slurped it up and it kept me very full until lunch. 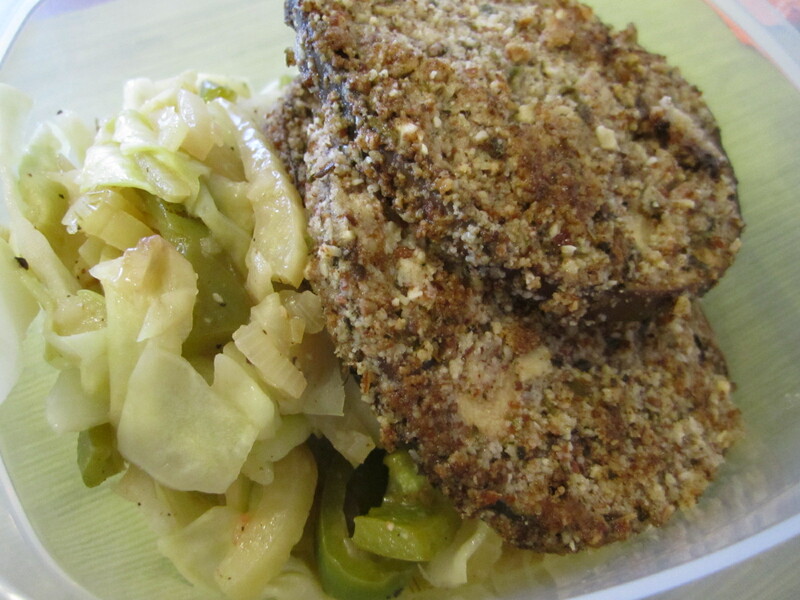 For lunch, I made up a bowl of leftover Cabbage Stirfry from last night and leftover Breaded Eggplant from Friday night’s dinner. I really really liked this stirfry! The flavors were awesome and the eggplant held up really well. 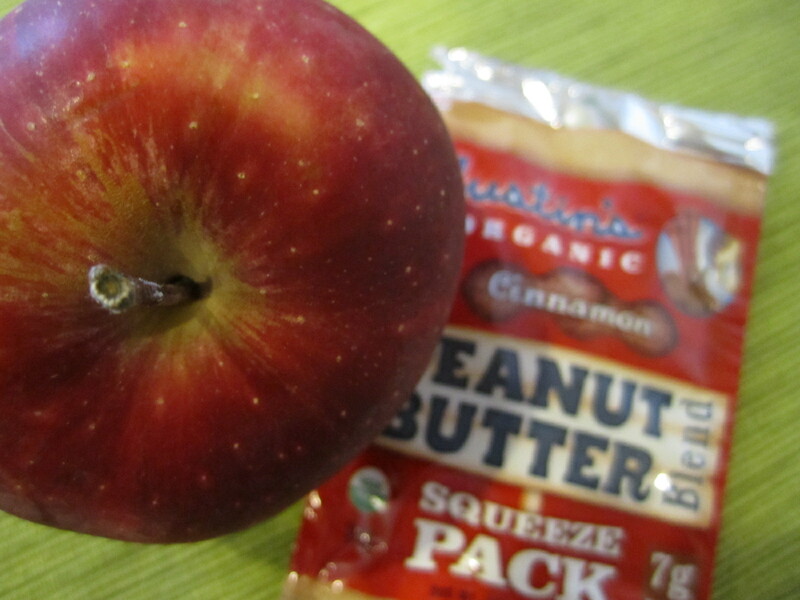 I also had an apple with cinnamon peanut butter as part of my lunch. 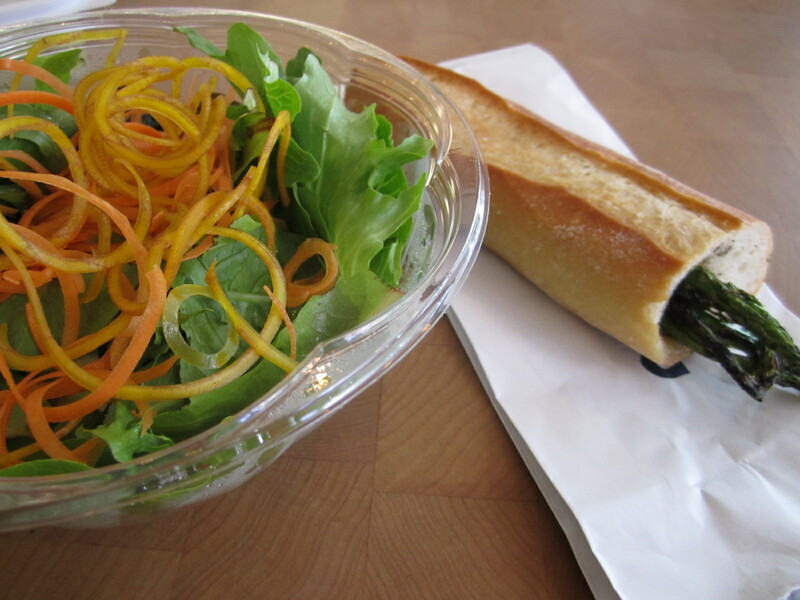 A good and filling lunch. 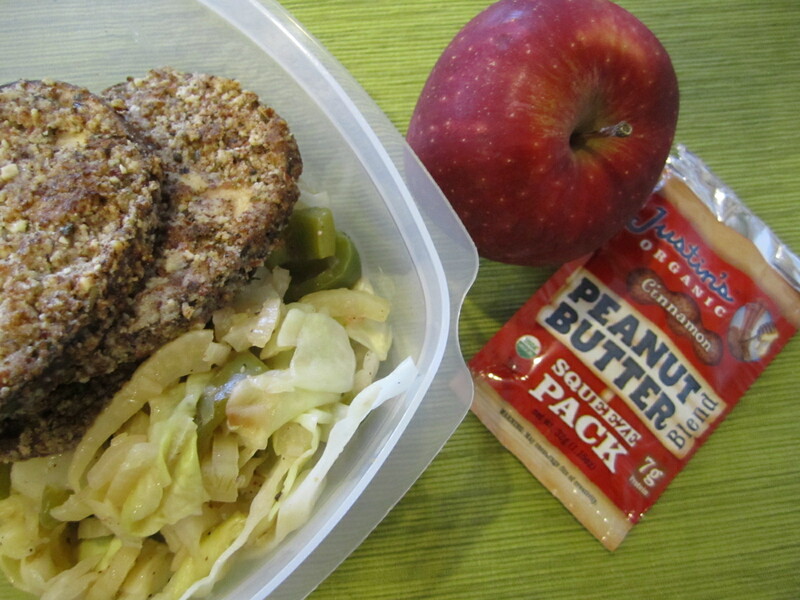 I always like when lunch has different parts to it. It keeps it interesting. 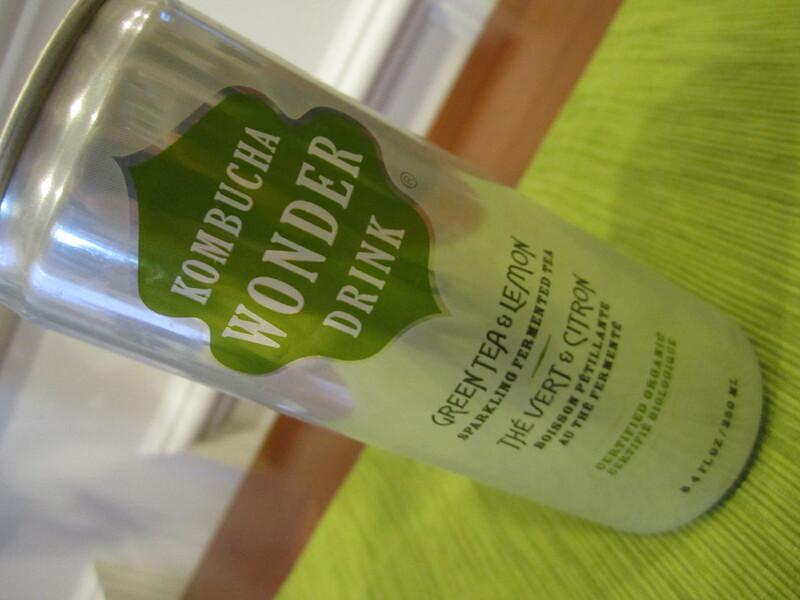 I hit up the Natural Foods Store on my way home to buy a few things and I picked up this Kombucha Drink as well. Mmmm…so good! It basically tasted like a sparkling lemonade. I loved it. It was $1.29 a pop at my local health foods store, but I have heard that they are more at Whole Foods. Each drink is 60 calories and contains Kombucha, green tea, lemon and natural cane sugar. Once I unpacked all of our CSA items (post with everything to come later this week), I got started on dinner. We kept it simple tonight because we were both hungry! 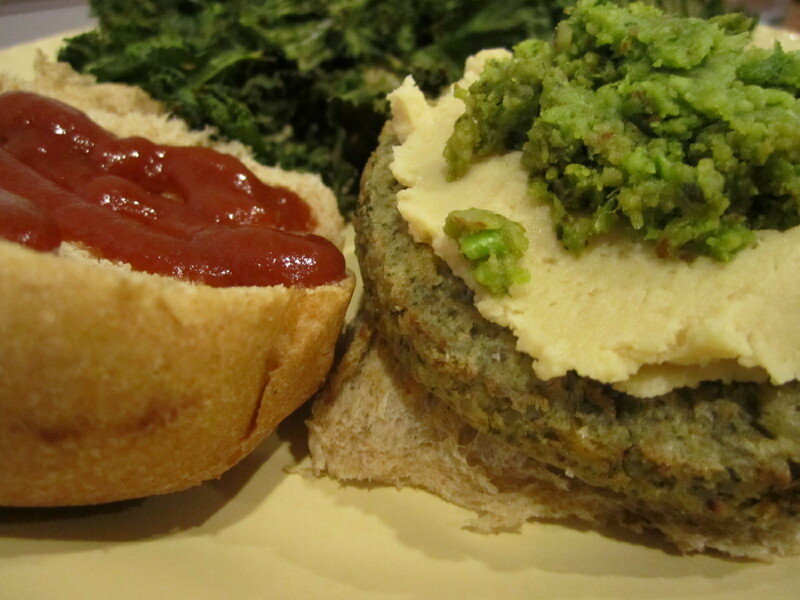 A Sunshine veggie burger on a whole wheat burger bun topped with lemon hummus, homemade pesto and ketchup. I’m not going to lie, this tasted great! 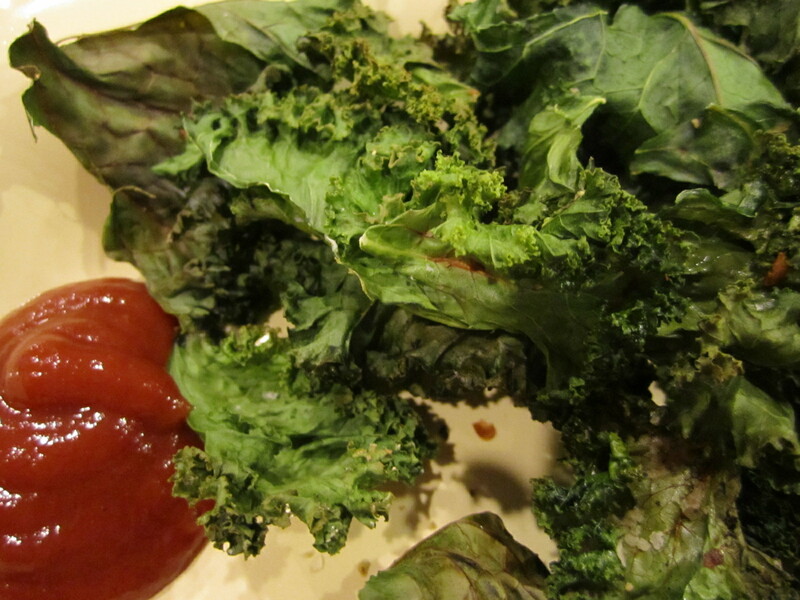 And, kale chips with a ketchup dipper. 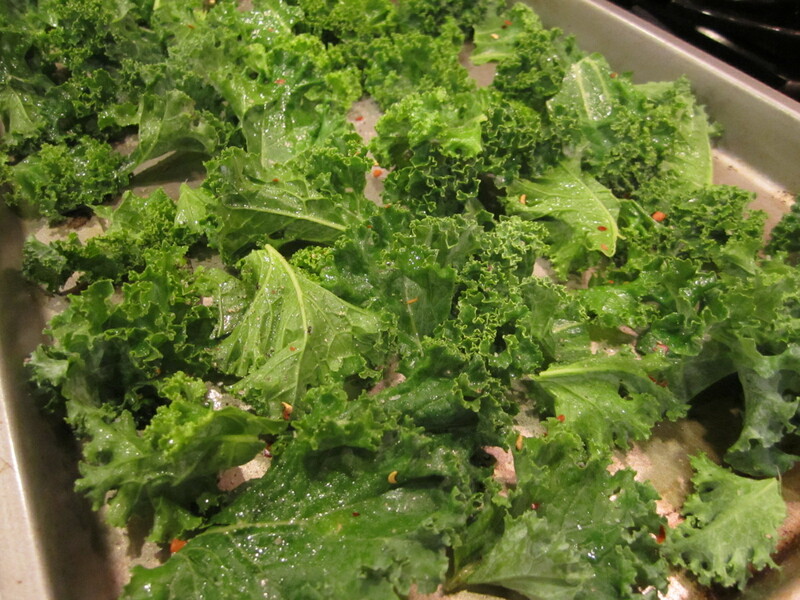 After washing and drying the kale, I sprayed the leaves with a little olive oil and sprinkled with sea salt and pepper. Then baked for 15 minutes at 350F. Kale chips are such a good way to get your family (and friends!) to eat their greens! They may not taste like potato chips, but they are pretty darn good, especially if you sprinkle them with salt and dip them in ketchup. Even kids would like them! 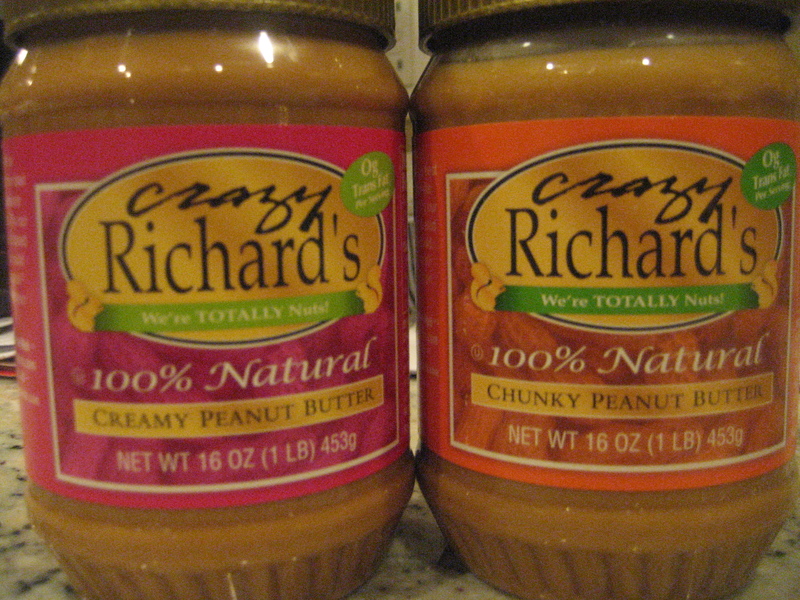 Many months ago, Krema & Crazy Richards sent me some peanut butter to review on the blog. I started out with the creamy versions of each of the peanut butters because I knew that I would like the crunchy better – and I was right! 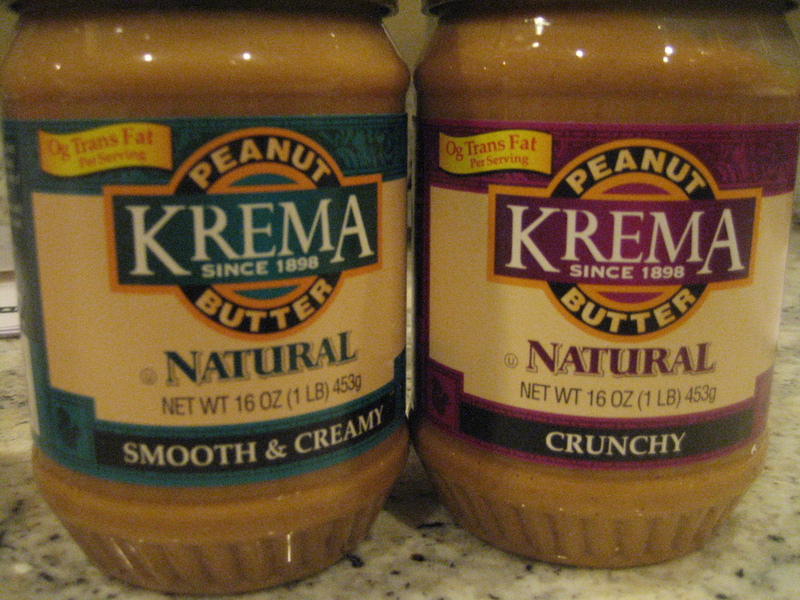 But, only because I prefer chunky over smooth nut butters anyday. I like a little crunch. Both brands taste the same. And, they are in fact the same recipe that are distributed as different brands in different parts of the country. 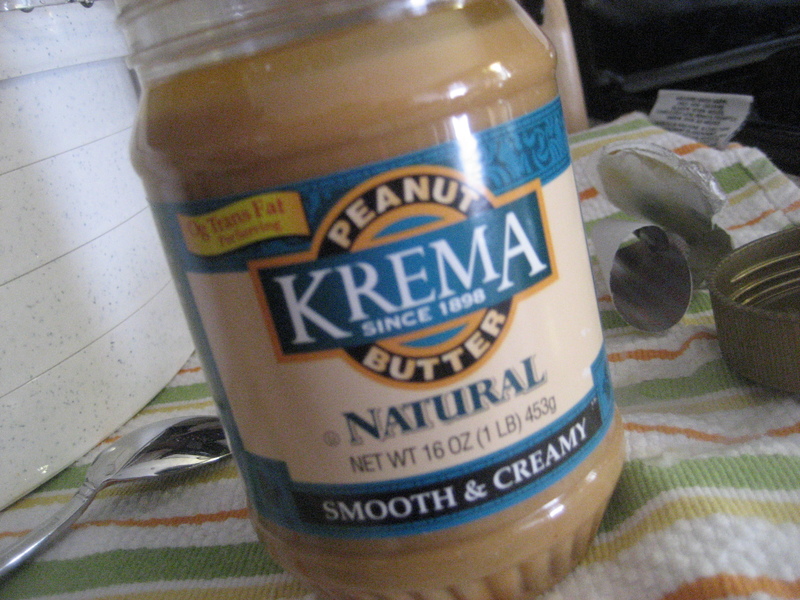 They are natural peanut butters, so they do seperate and have quite a bit of oil on top. But, just stir it up and you are good to go. The ingredient list for all 4 jars was amazing – Ingredients: Peanuts – You cannot get any better than that! I ate the peanut butter as I normally would. 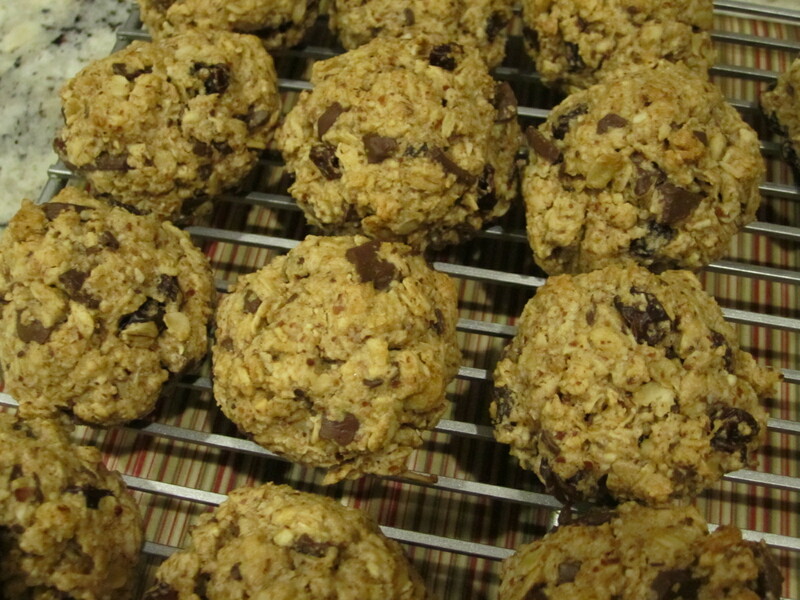 And, then I also enjoyed the peanut butter in the best way possible…in cookies!! 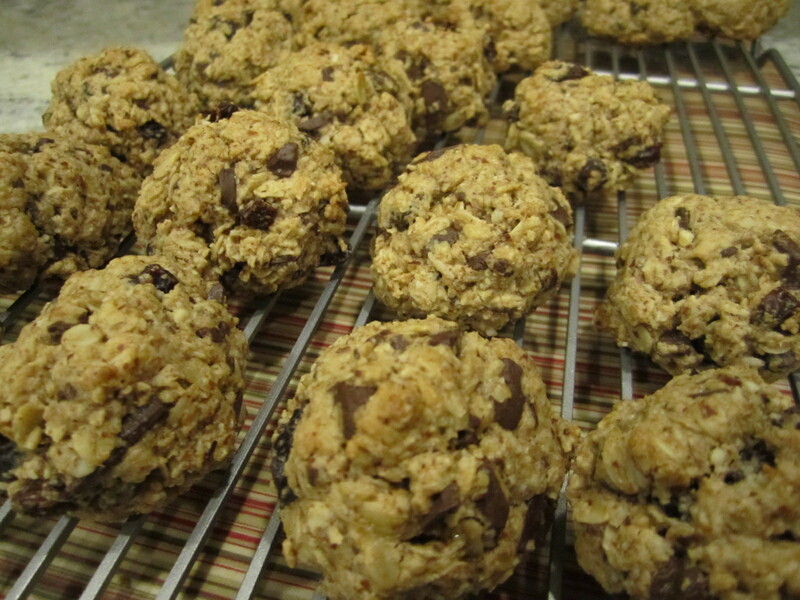 These are Super Charge Me cookies from Eat, Drink & Be Vegan. Vegan or not, it is a wonderful recipe! One in which you can change up the ingredients that are in there. 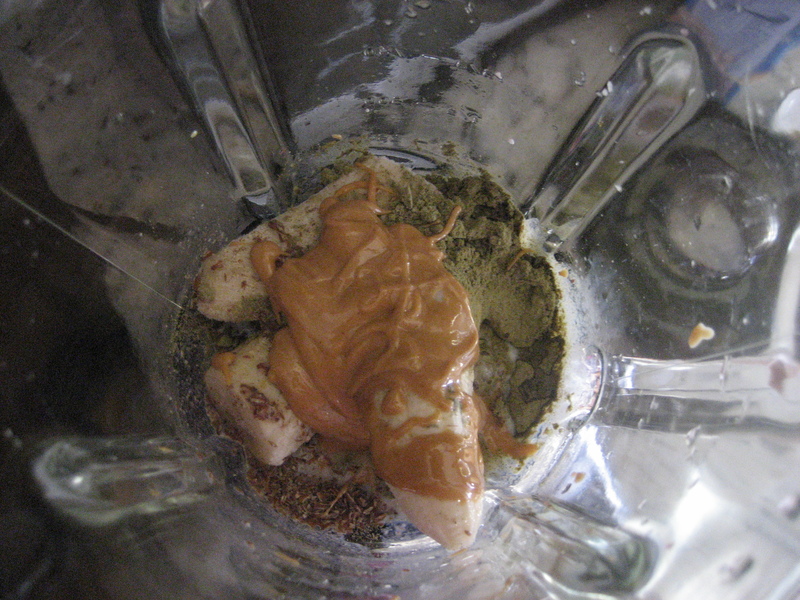 I have added almond butter and cashew butter in the past, but this time I added peanut butter and they came out fabulous! 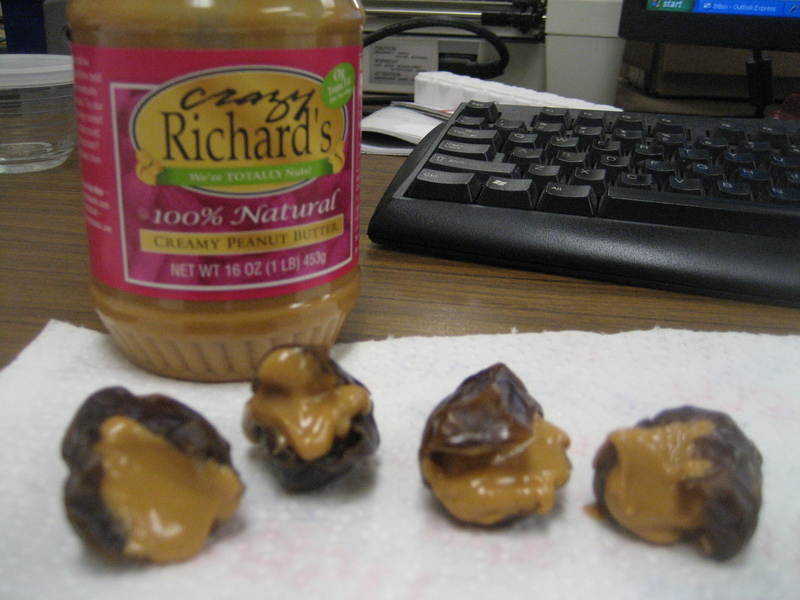 Such a super peanut buttery taste – yum! Simple ingredients make simple, easy and delicious foods. They are the perfect treat for our Fourth of July celebration! 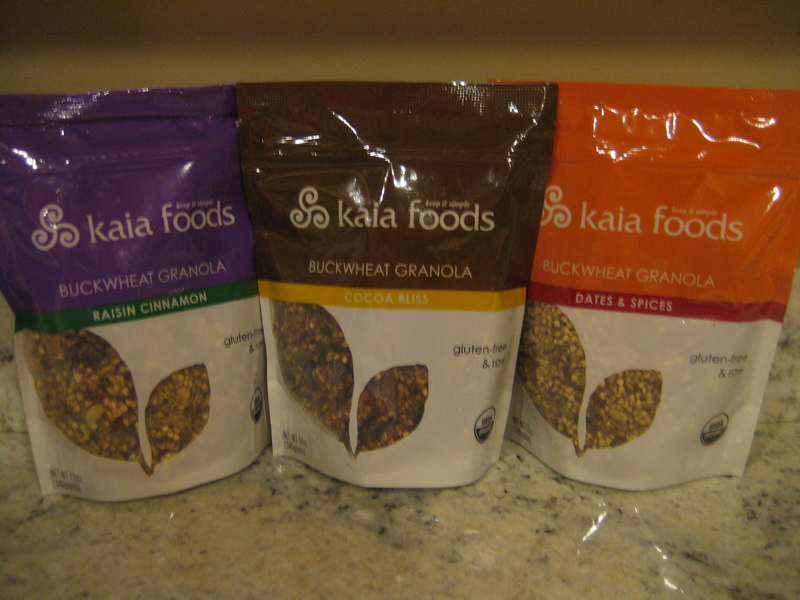 A few months ago, Kaia Foods graciously sent me some samples of their raw and vegan foods. 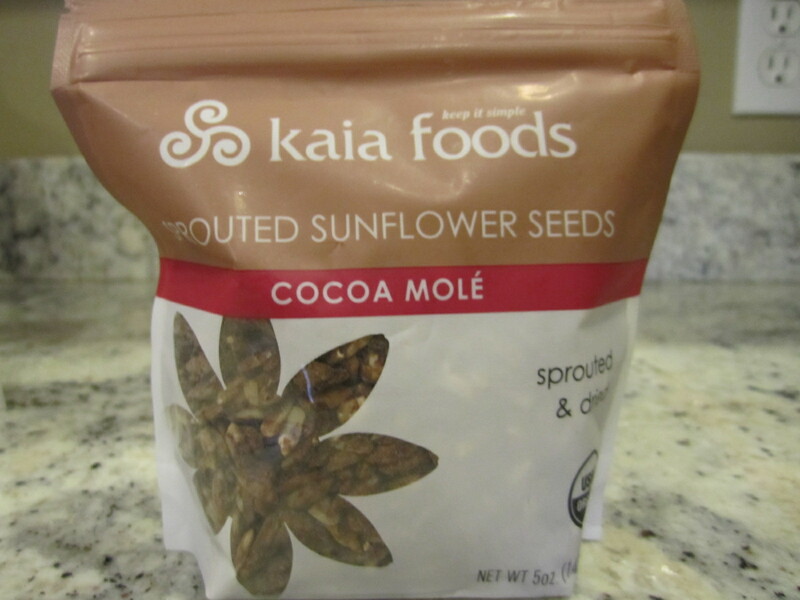 Kaia foods was founded with the belief that our health is best supported by eating an abundance of minimally processed whole foods. We sprout, mix and dehydrate our organic foods at low temperatures so that they remain ‘raw.’ No baking, frying, bleaching, or weird processing steps! I was psyched when I received this package! The products fit perfectly with what I believe food should be about. 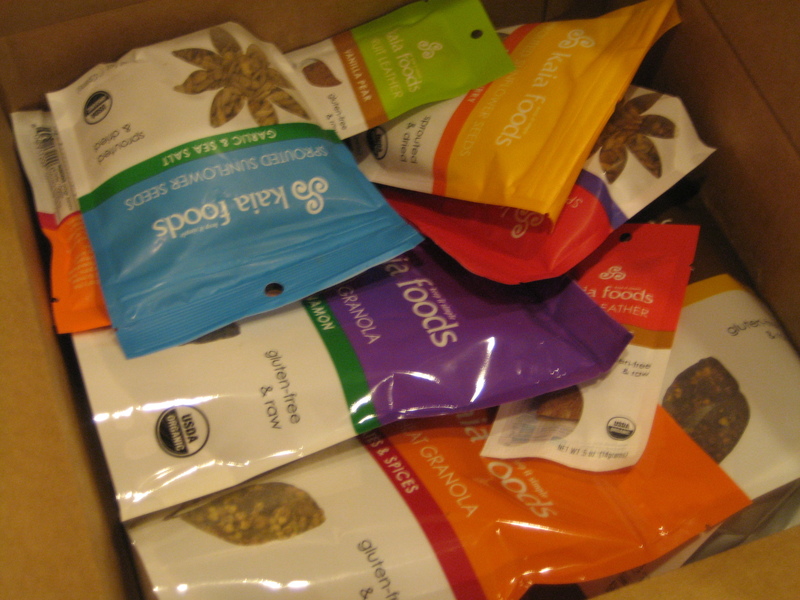 I was sent their 3 flavors to try out – Cocoa Bliss, Dates & Spices and Raisin Cinnamon. Made with sprouted buckwheat, sprouted walnuts, sprouted sunflower seeds, sprouted pumpkin seeds, coconut, ground flax seeds, and agave nectar, plus dried fruits and seasonings. I had never tried a raw granola before, so I honestly was not sure what to expect here. I figured that I couldn’t go wrong with the Cocoa Bliss being the chocolate lover that I am, so I started here. 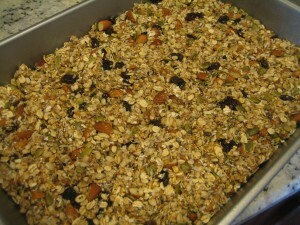 It contains big chunks in the bags, which I really enjoy in my granola. Did I like it? I loved it! 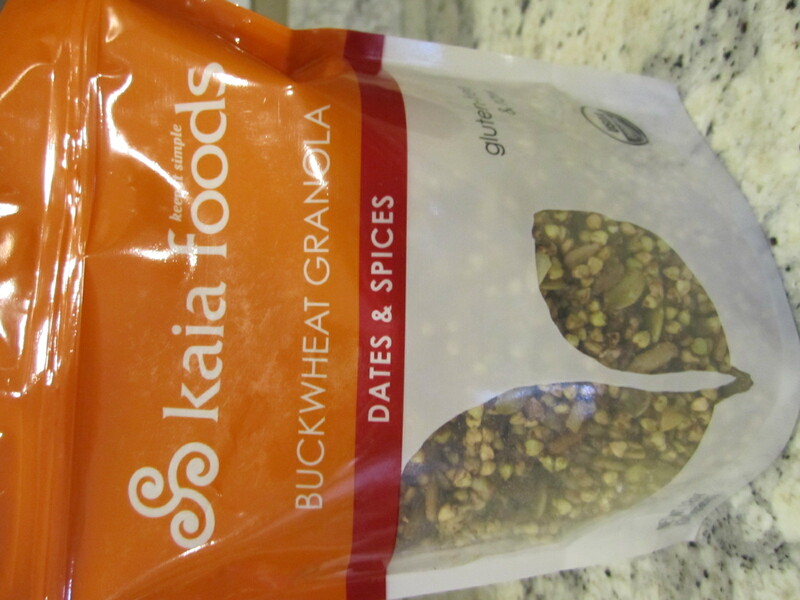 The buckwheat gives the granola a super crunch and the raisins add a little chew to it. The chocolate flavor comes through nicely, but is not overpowering by any means. This was my favorite out of all 3 granolas! I really liked this flavor as well. I liked that there was definitely a hint of spice, but it was not all that you would taste. Once again, I love the crunch of the buckwheat. This was my second favorite! I loved the hint of cinnamon that came through, and all of the raisins. YUM! 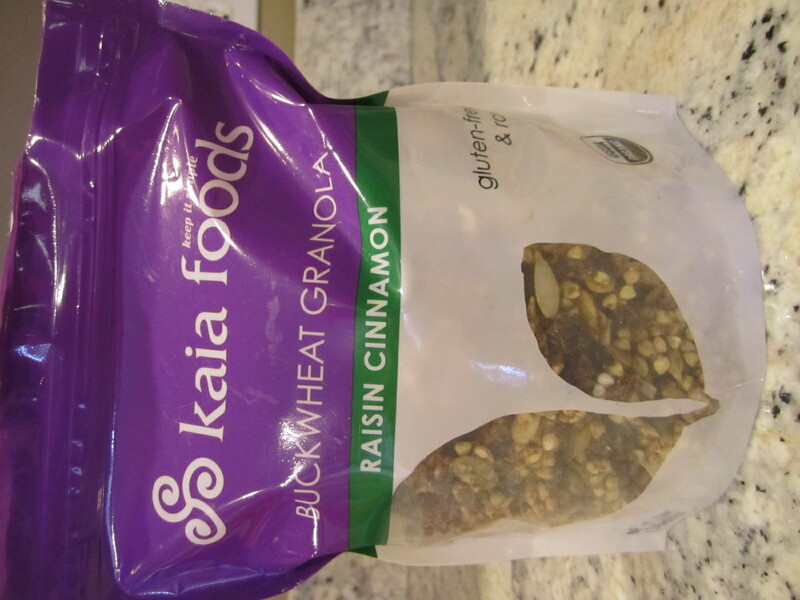 If you like buckwheat, I highly recommend this granola. It is different than your typical granola and in my opinion is better because it gives your body more essential nutrients while you eat! 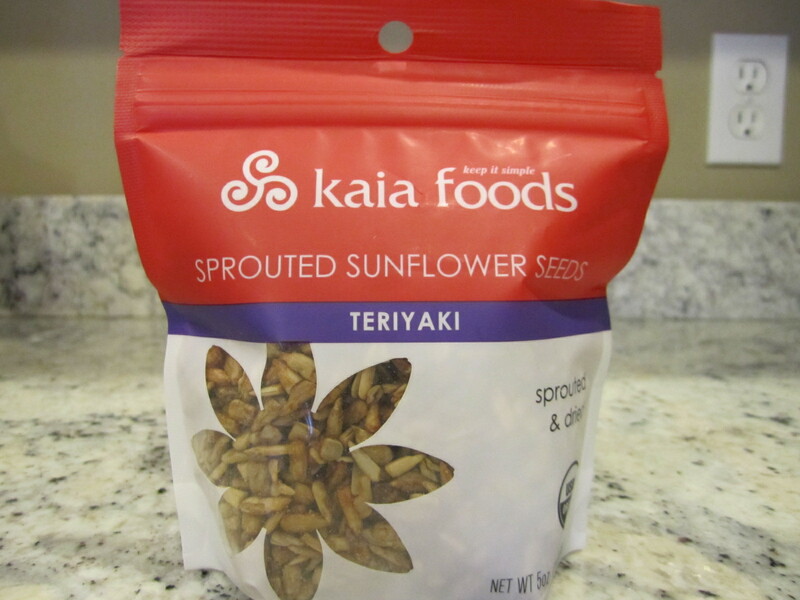 All we do to our sunflower seeds is sprout, season and dehydrate them at low temperatures instead of roasting them. 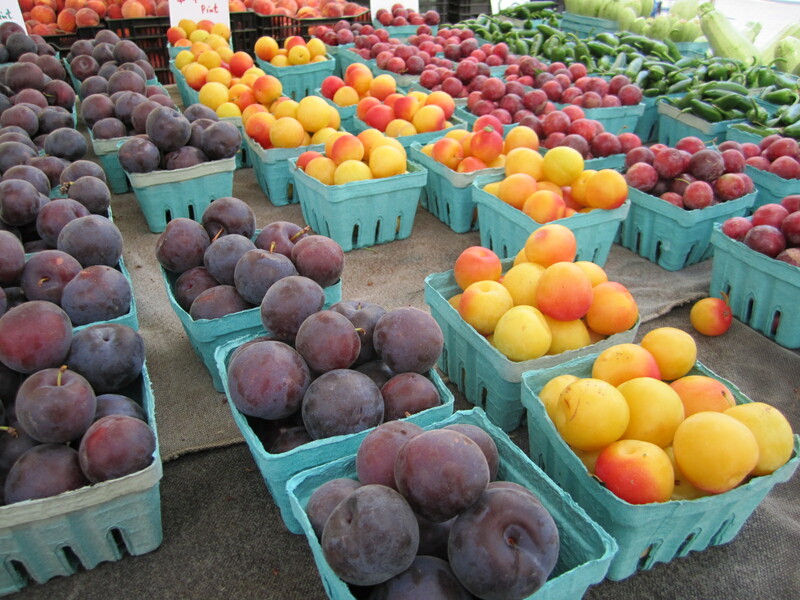 The nutrients and great taste stay intact and aren’t processed away. 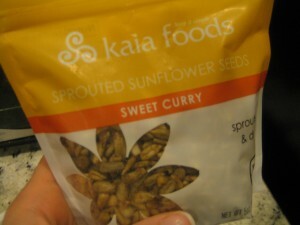 I was sent 4 flavors of their sunflower seeds: Garlic & Salt, Sweet Curry, Teriyaki and Cocoa Mole. This flavor was great. Salty with a hint of garlic. Not too overpowering. Yum! These had a mild sweet taste that I loved. I am a big fan of terriyaki sauce, so I did like these. The flavor is that of a typical terriyaki – not too sweet, but not spicy either. In my opinion, the curry was better! Overall, the sunflower seeds are delicious! The actual sunflower seeds do not taste any different than what you would normally buy, but they are sprouted which makes them healthier for you. I typically buy raw seeds and stay away from the roated and salted seeds for health reasons, so I would purchase these in a second. To make our fruit leathers we puree whole organic fruits and dehydrate them at low temperatures, without adding sugars or concentrates. Yum! 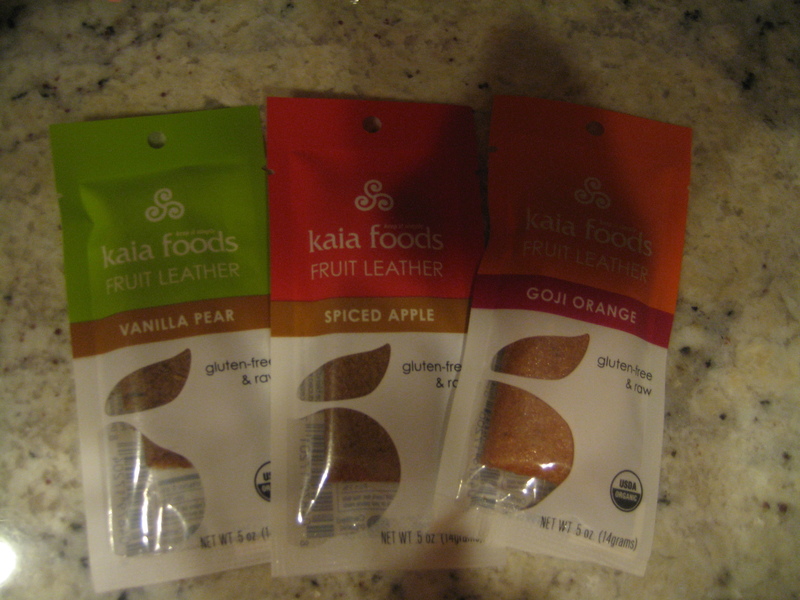 I was sent 3 flavors of fruit leathers to try: Vanilla Pear, Spiced Apple and Goji Orange. When I opened these, I was not sure what to expect. 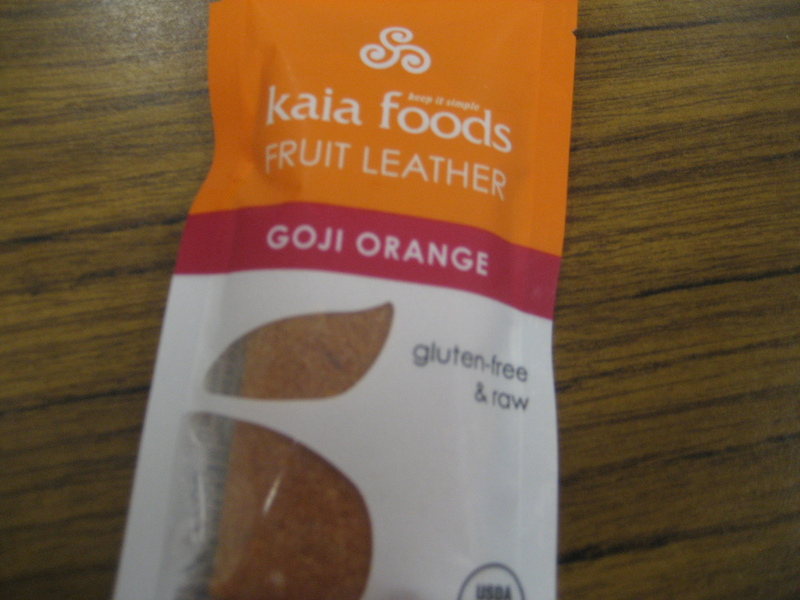 They seemed drier and flakier than the typical fruit leather that I was used to, but I was willing to give it a shot! Mmmm…very orangy! I liked it. I was a big fan of all of the fruit leathers, so I am having trouble picking a favorite! If I had to though, I think this is it! I love the pear that comes through. 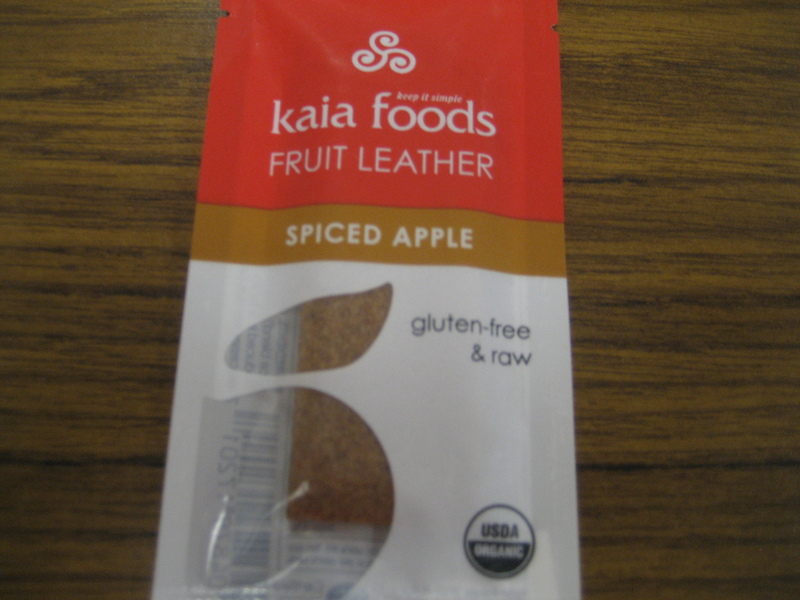 Overall, I really enjoyed all of Kaia Foods products. They use minimal ingredients and a very minimally processed which allows the products to keep most of their nutritional value intact. I would buy each of the products again without hesitation because I feel really good about eating them! 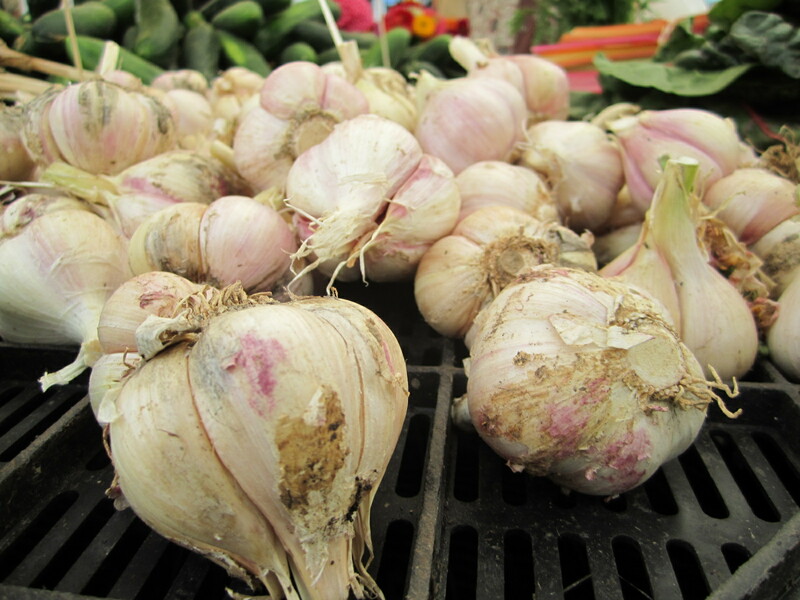 As part of our mission to improve quality of life through proper nutrition we invest 1% of sales in fighting hunger. We currently donate to The Hunger Project and to the United Nations World Food Program.